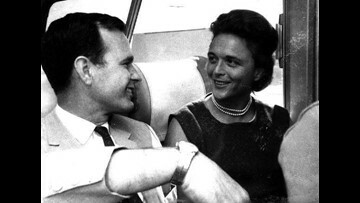 George and Barbara Bush during the Senate campaign, 1964. 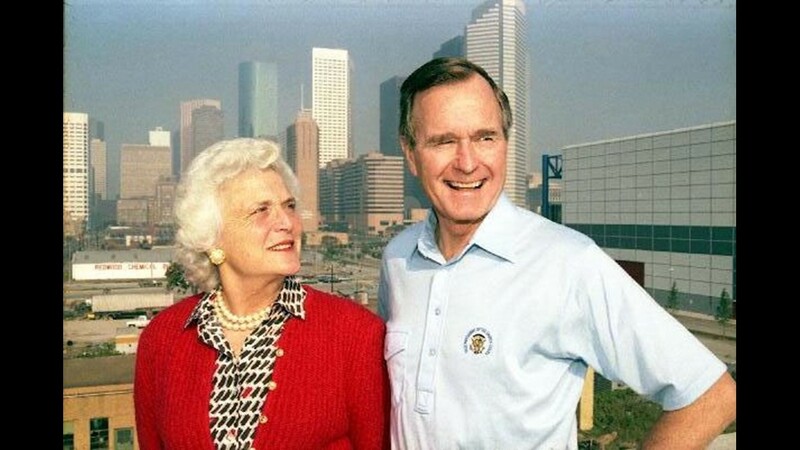 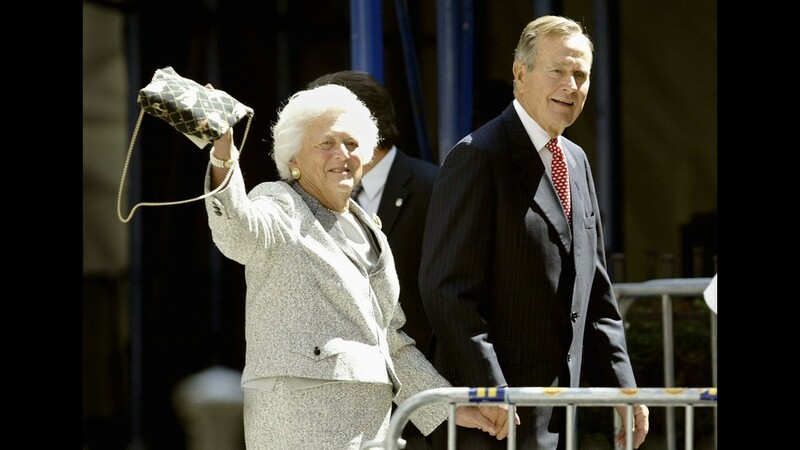 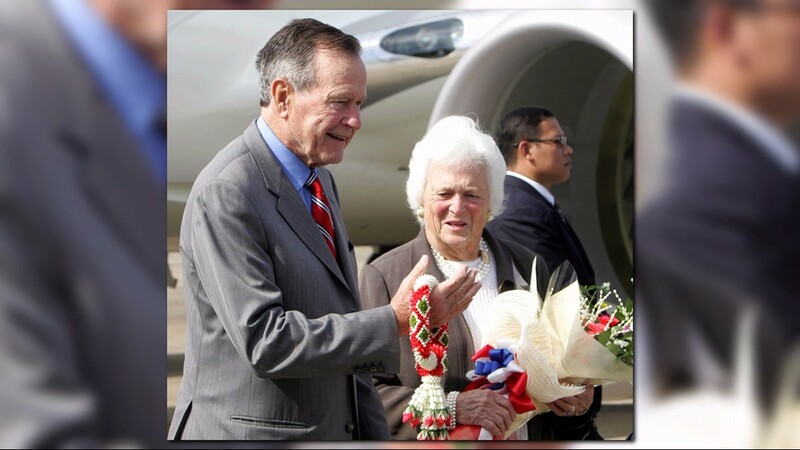 President and Mrs. Bush arrive Houston, Texas, January 20, 1993. 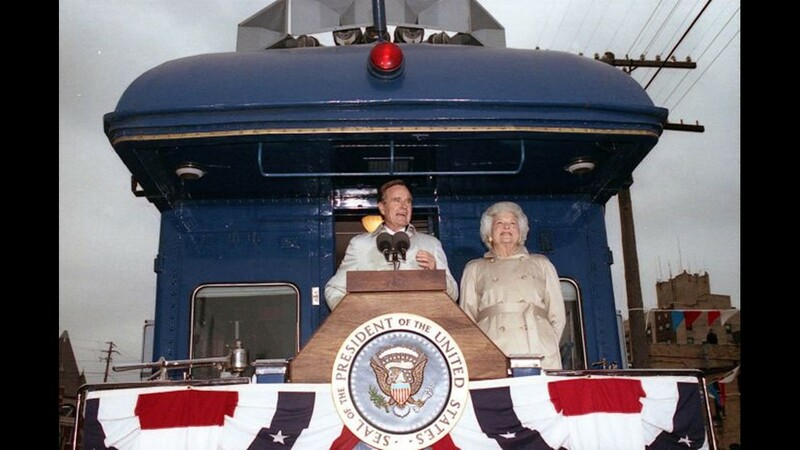 President and Mrs. Bush at Walker's Point, Kennebunkport, Maine, August 31, 1990. 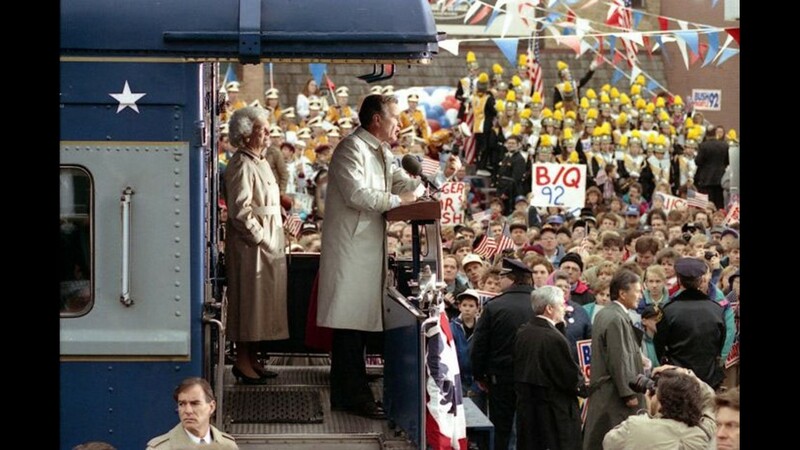 President Bush addresses supporters from the "Spirit of America" campaign train as Mrs. Bush looks on, Oshkosh, Wis., October 31, 1992. 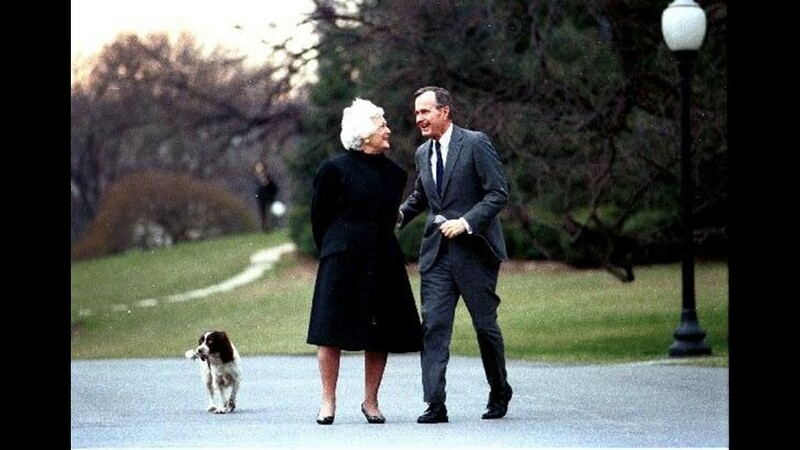 President and Mrs. Bush walk with Millie, March 3, 1989. 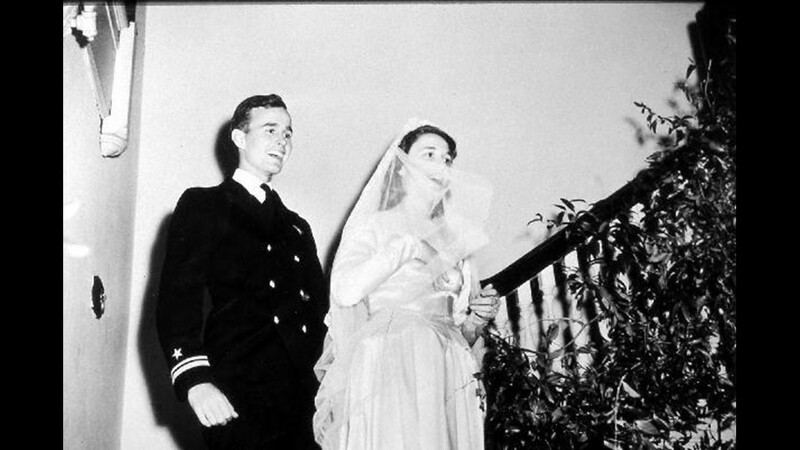 The wedding of George and Barbara Pierce Bush, Rye, NY, January 6, 1945. 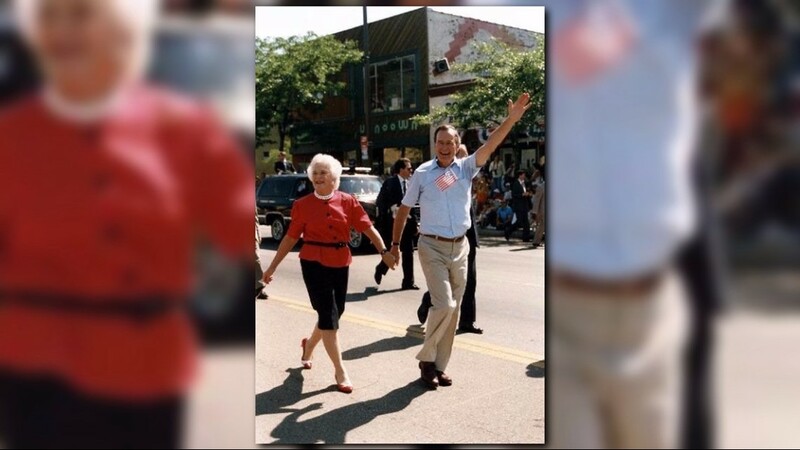 Vice President and Mrs. Bush attend the July 4th Parade in Wyandotte, Mich., July 4, 1988. 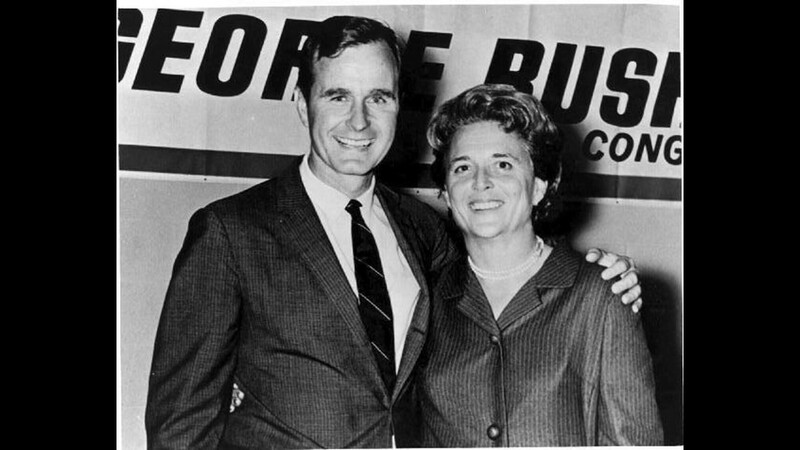 George and Barbara Bush celebrate his election to Congress at campaign headquarters, 1966. 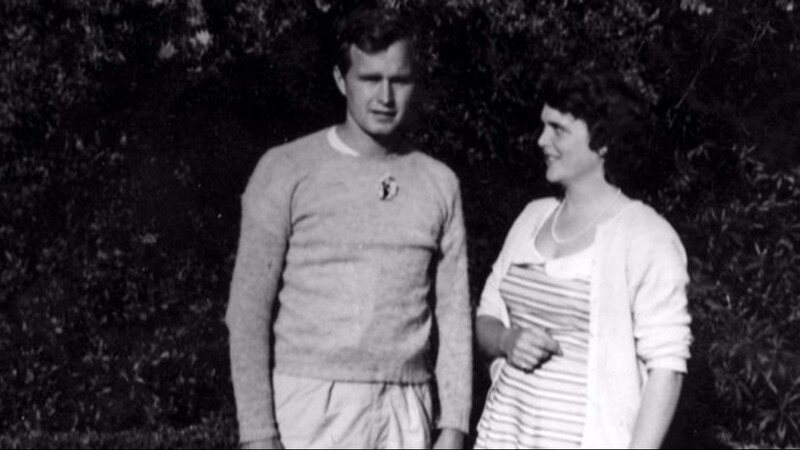 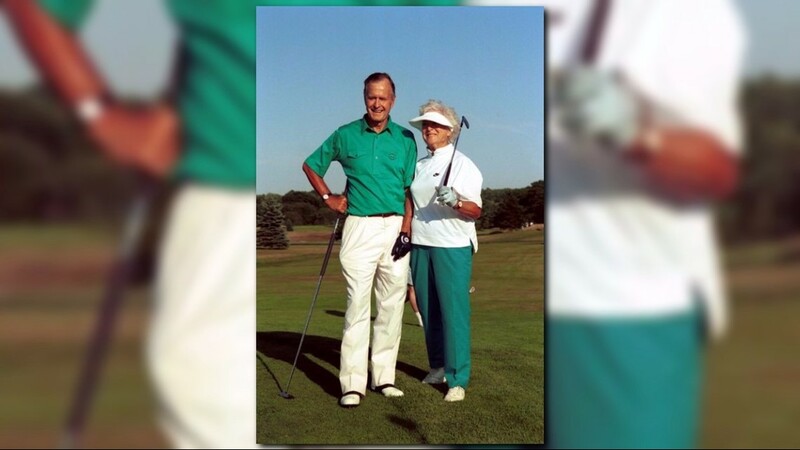 George and Barbara Bush during the campaign for the Senate, 1964.
resident and Mrs. Bush play golf, Kennebunkport, Maine, August 7, 1991. 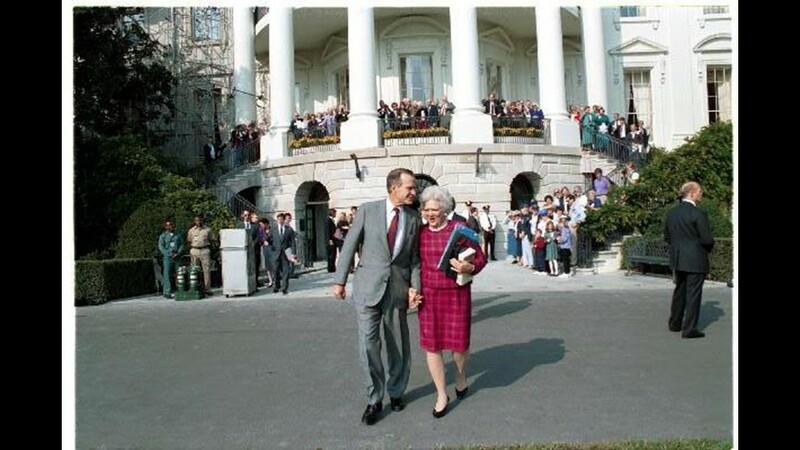 President and Mrs. Bush walk around the south grounds of the White House prior to leaving for the inauguration ceremonies, January 20, 1993. 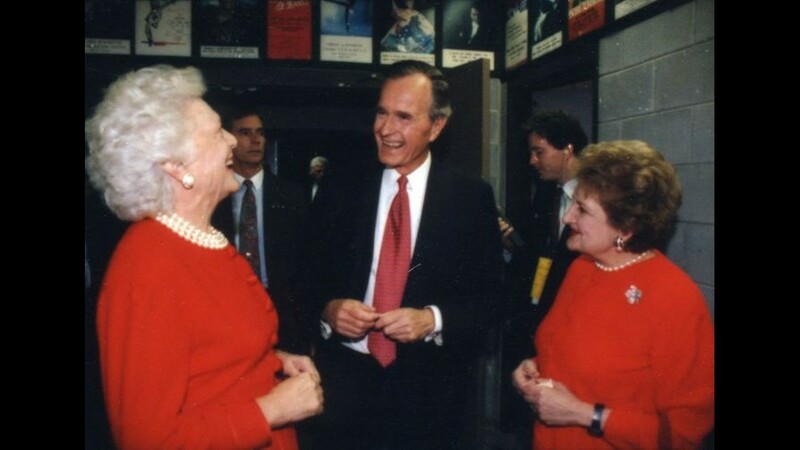 President and Mrs. Bush share a laugh with Helen Thomas following the third presidential debate in East Lansing, Mich., October 19, 1992. 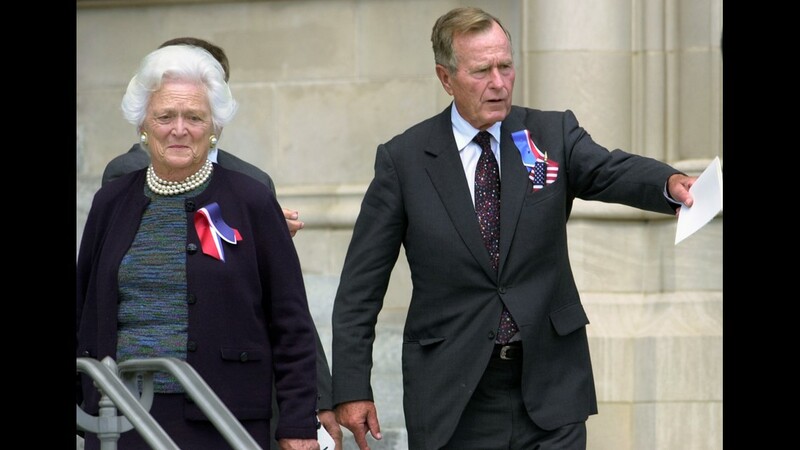 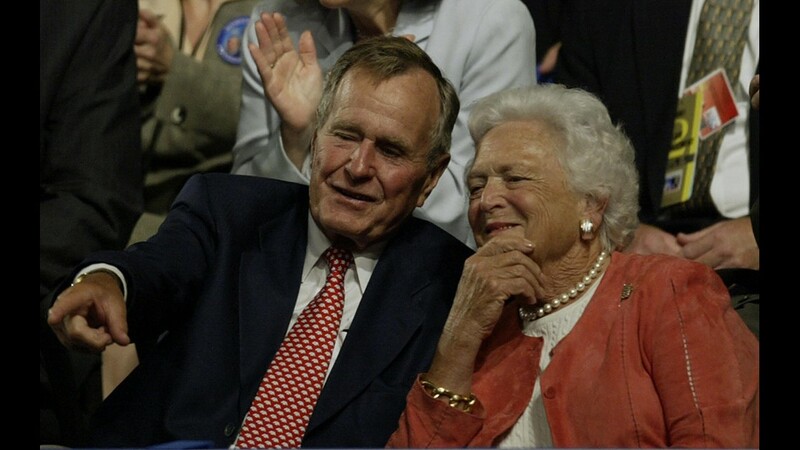 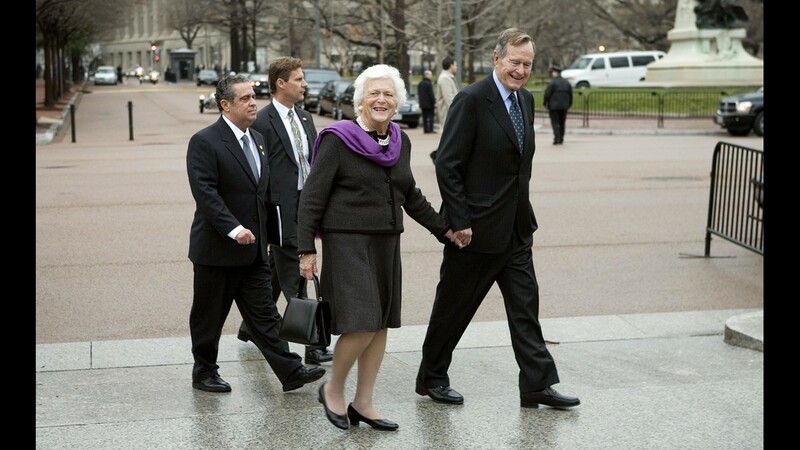 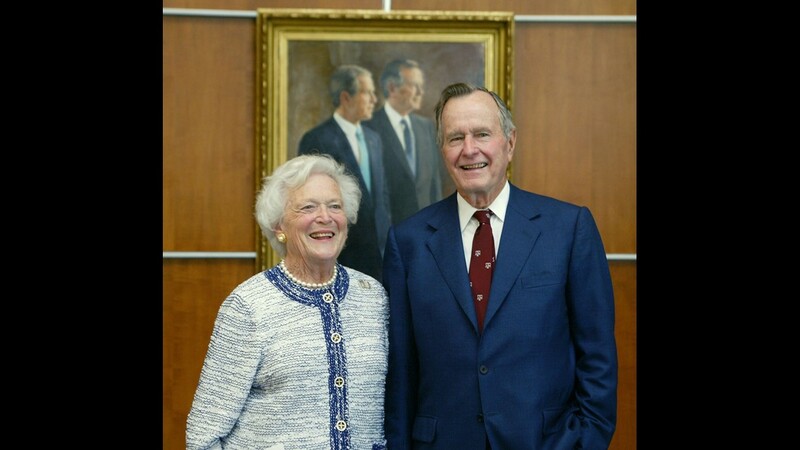 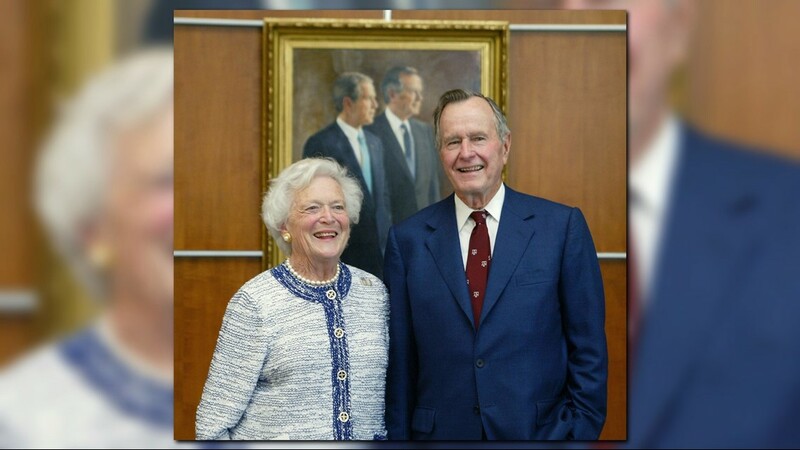 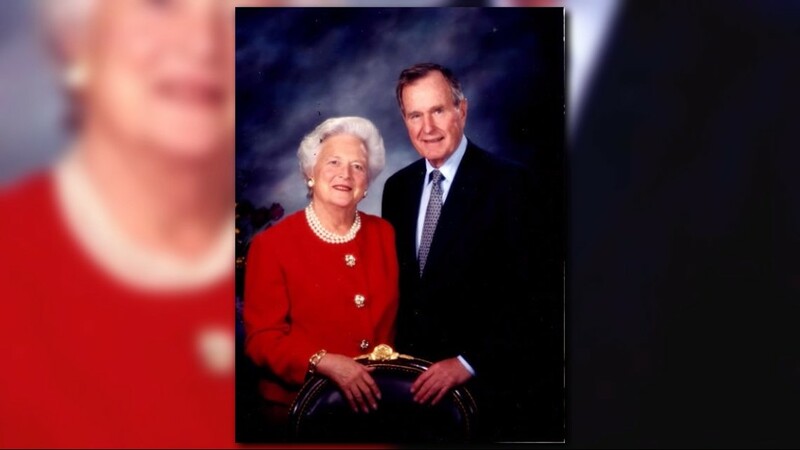 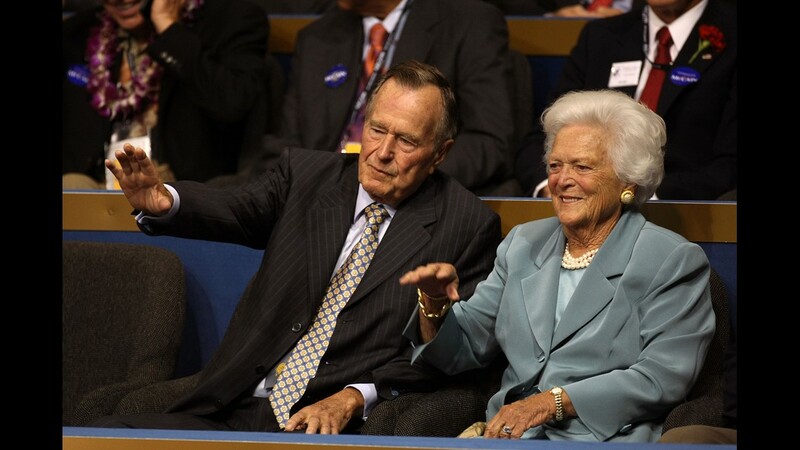 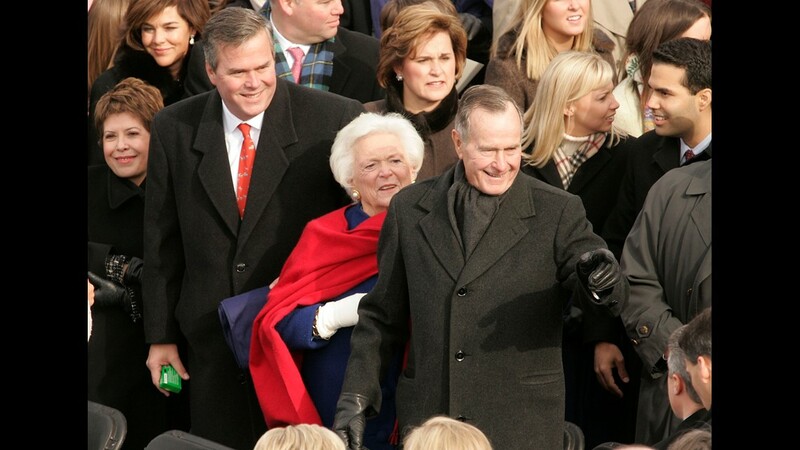 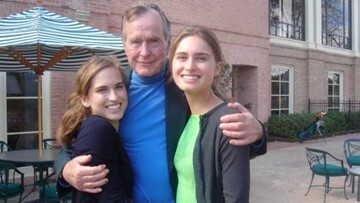 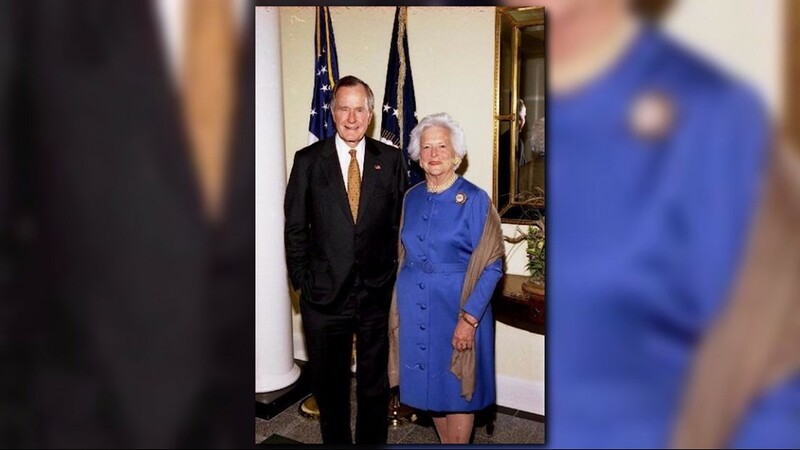 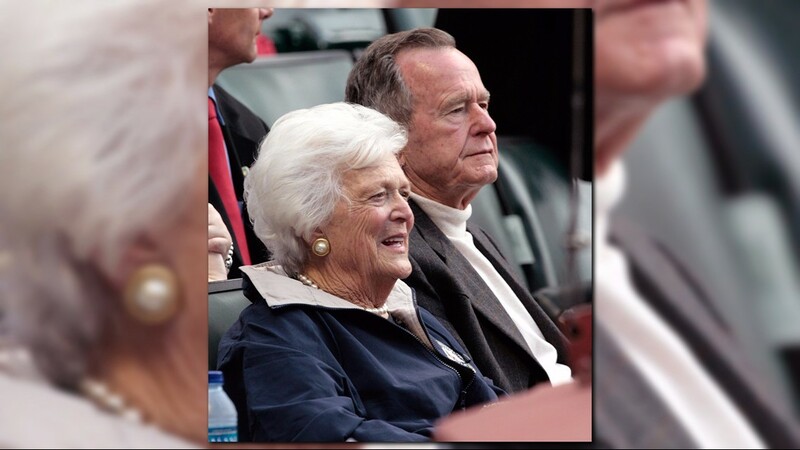 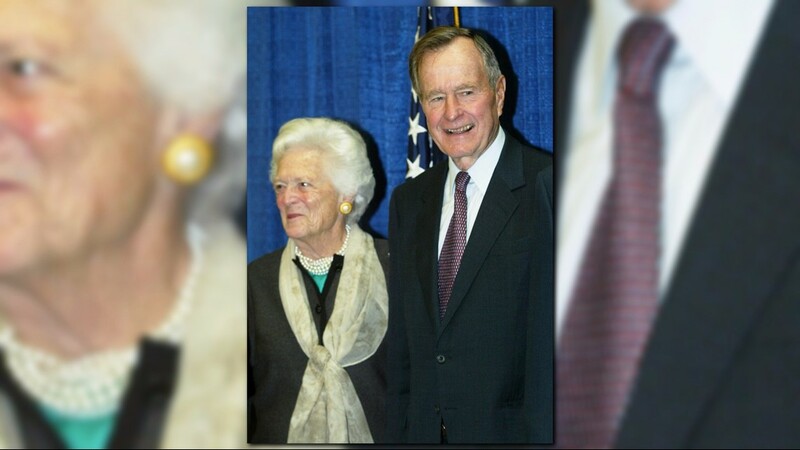 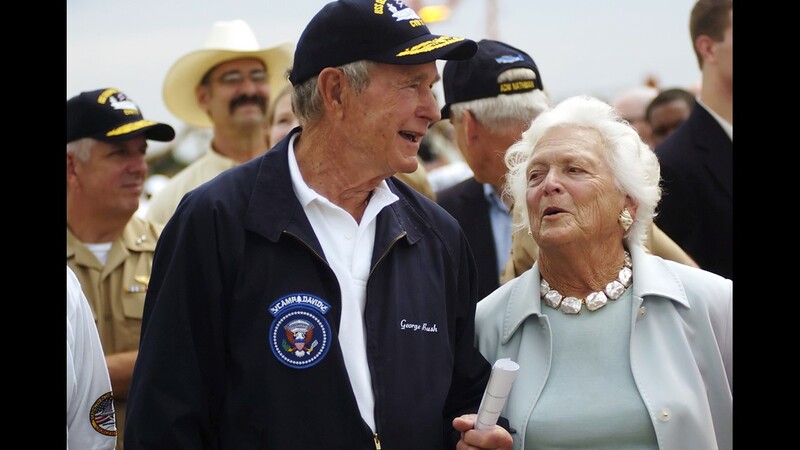 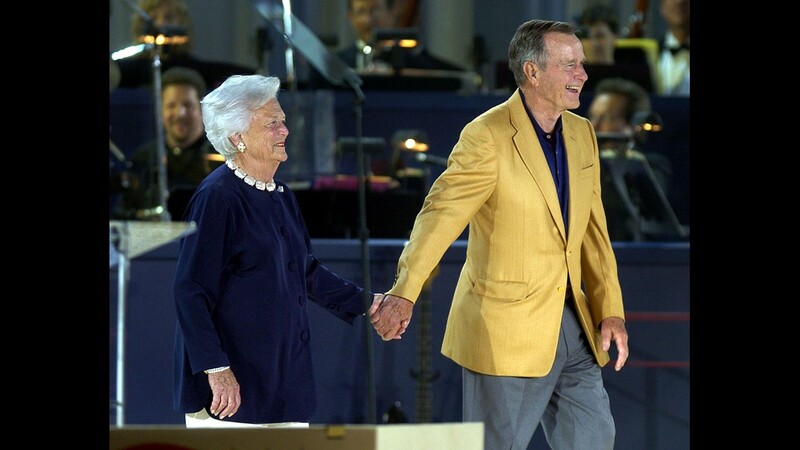 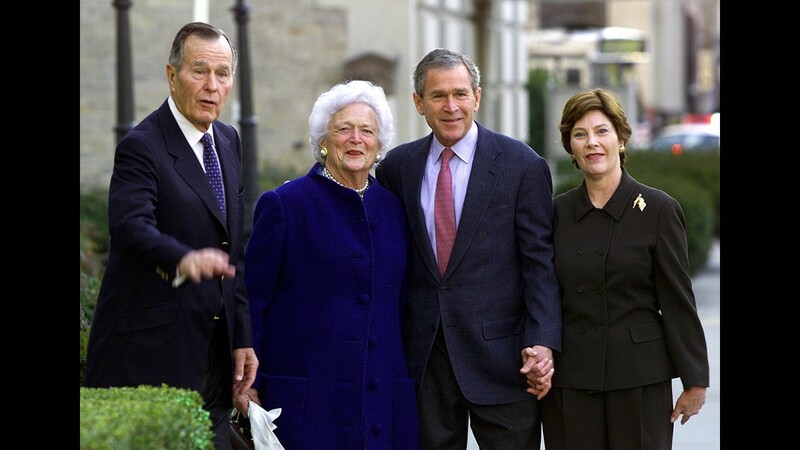 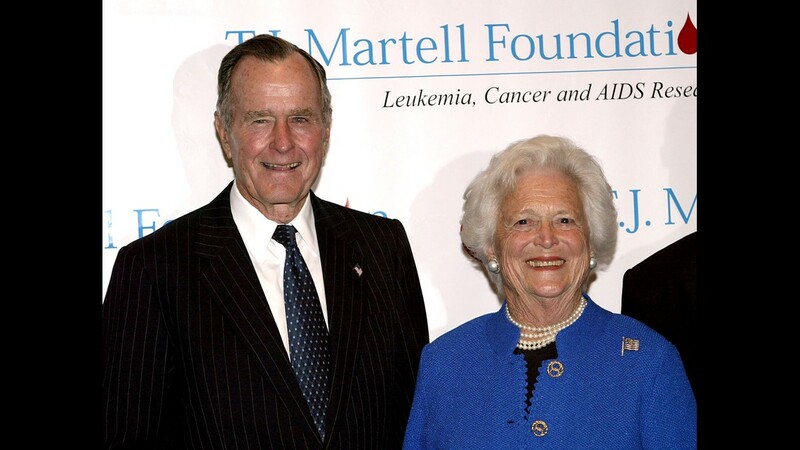 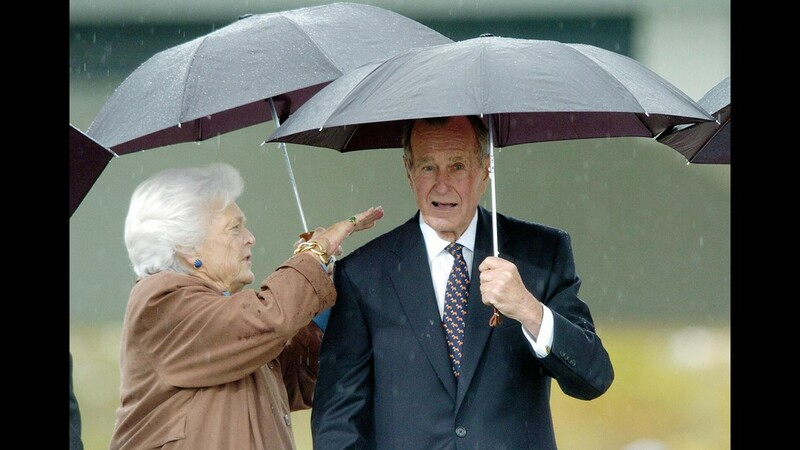 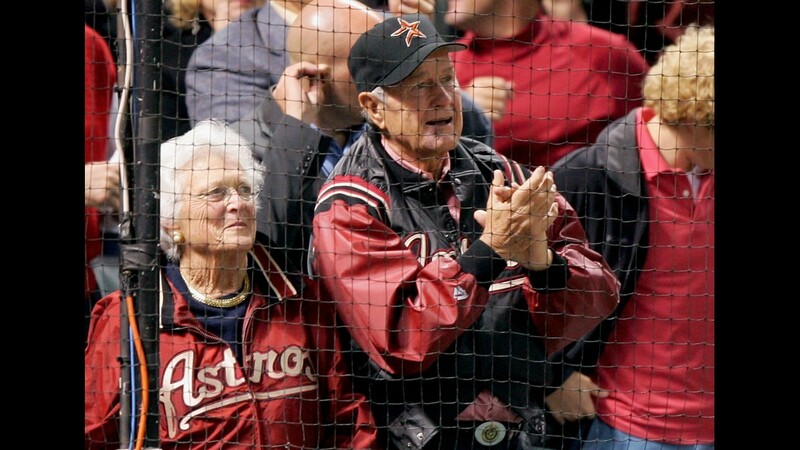 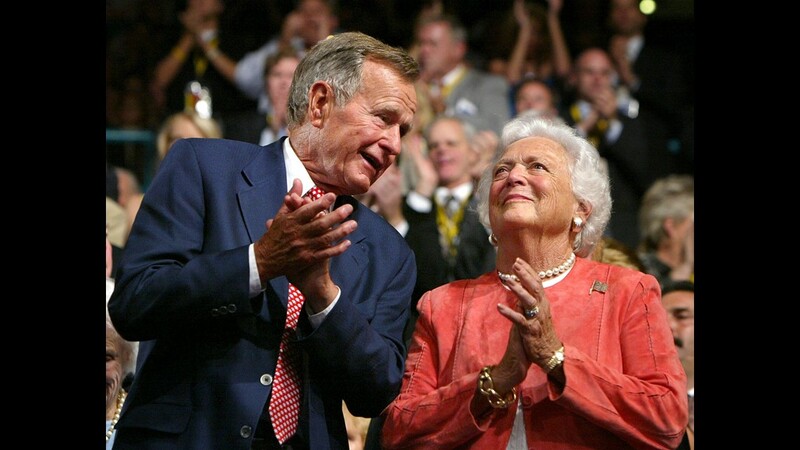 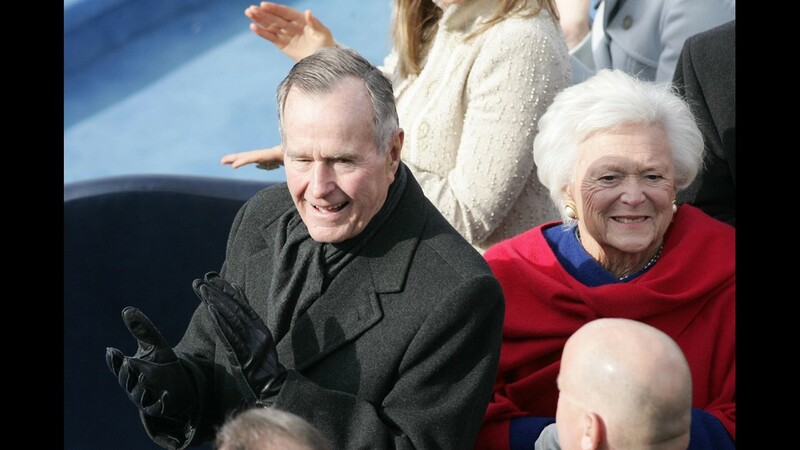 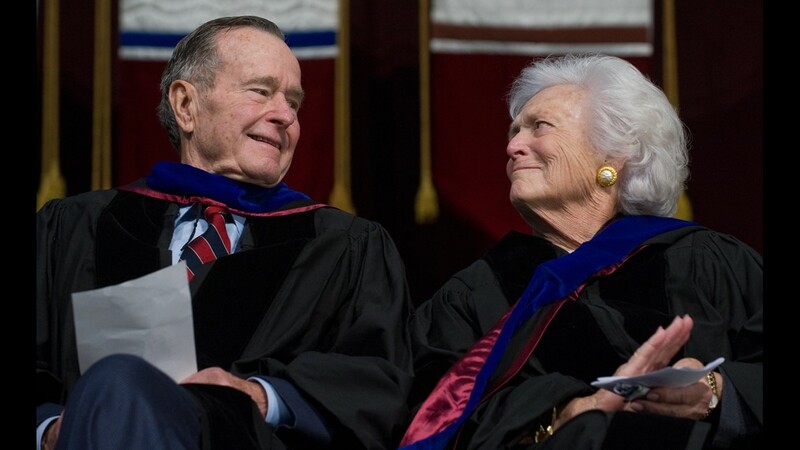 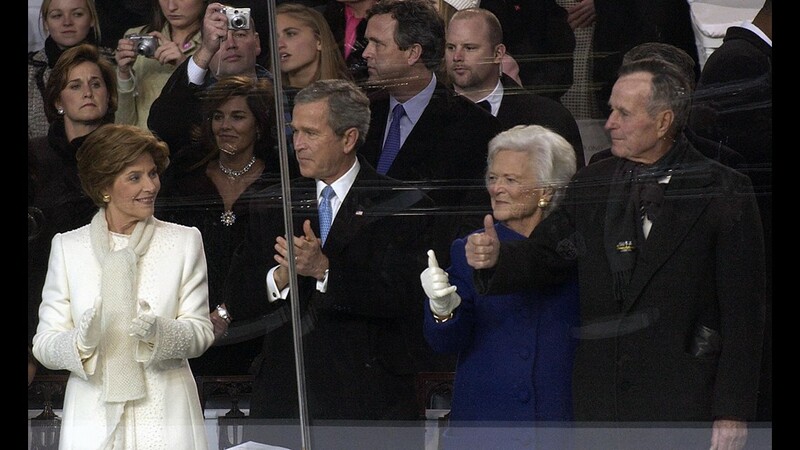 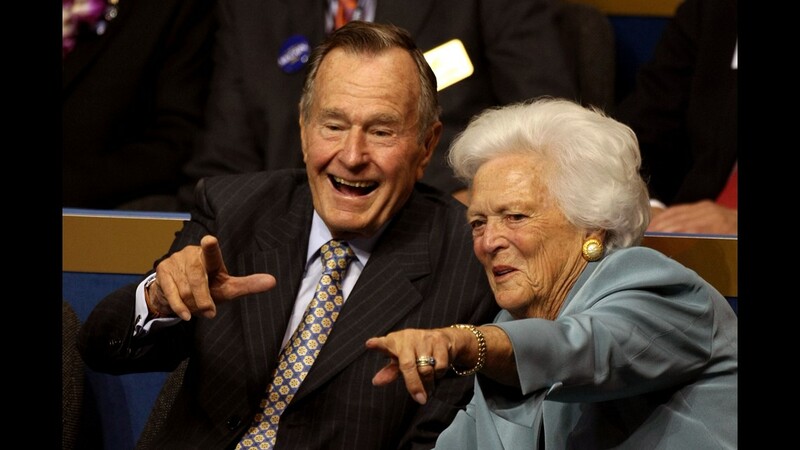 Former President and Mrs. Bush at the George Bush Presidential Library Complex, February 28, 2002. 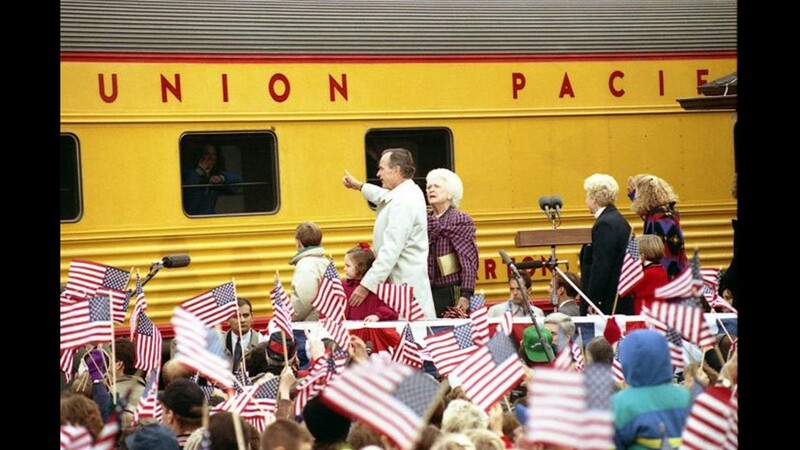 President and Mrs. Bush arrive the train station in Burlington, Wisconsin, October 31, 1992. 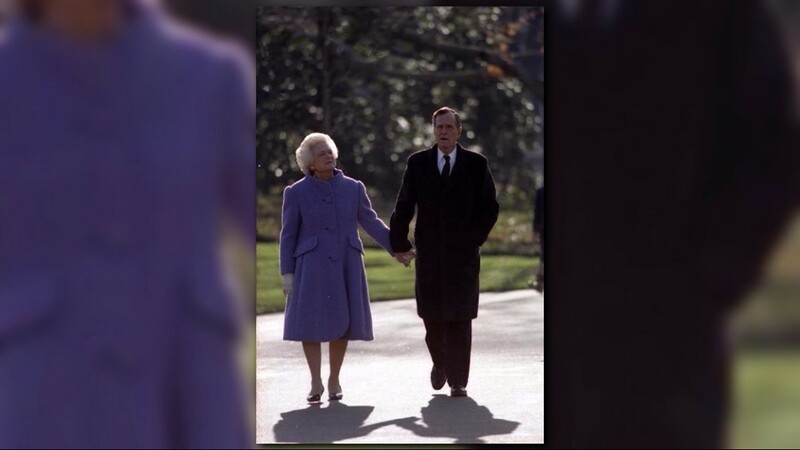 President and Mrs. Bush walk arm-in-arm toward Marine One upon their departure for Camp David, September 29, 1989. 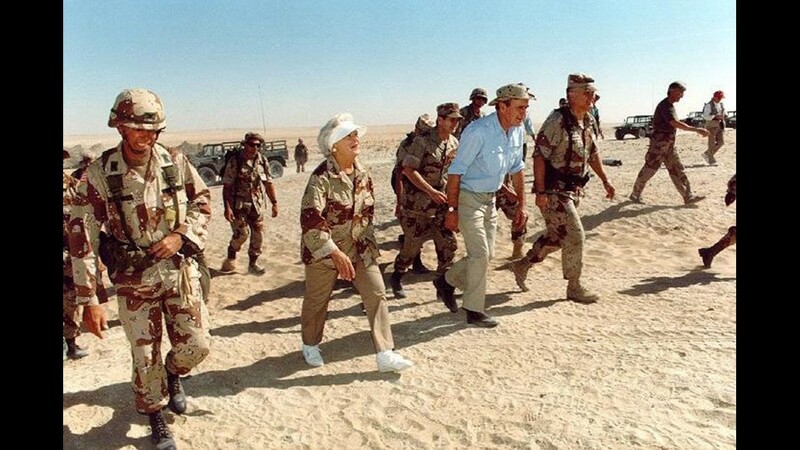 President and Mrs. Bush walking along the desert in Saudi Arabia with General Schwarzkopf and entourage, November 22, 1990. 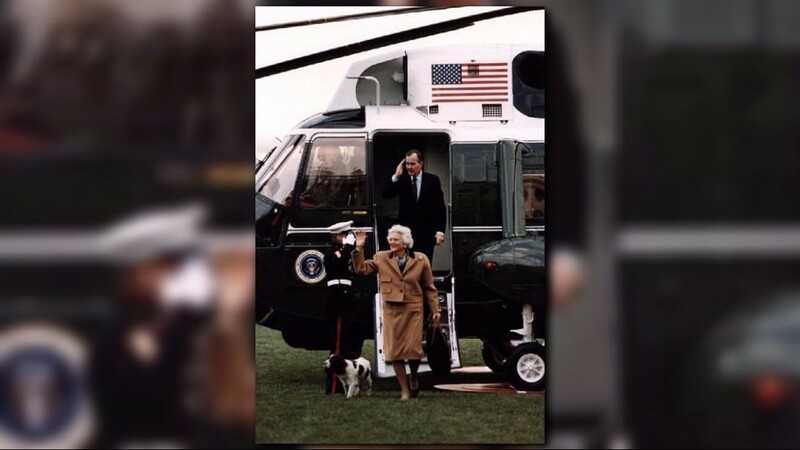 President Bush, Mrs. Bush, and Millie leave Marine One, March 12, 1989. 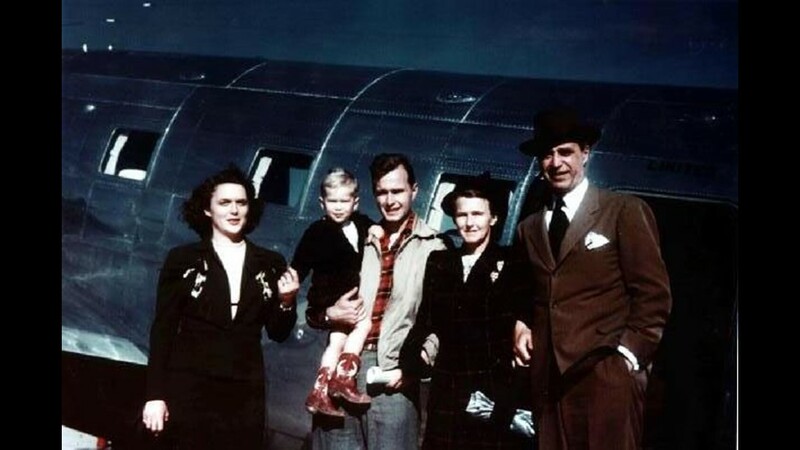 George W. Bush with his mother, Barbara Bush; father, George Bush; and grandparents, Dorothy and Prescott Bush, in Midland, Texas, March 7, 1949. 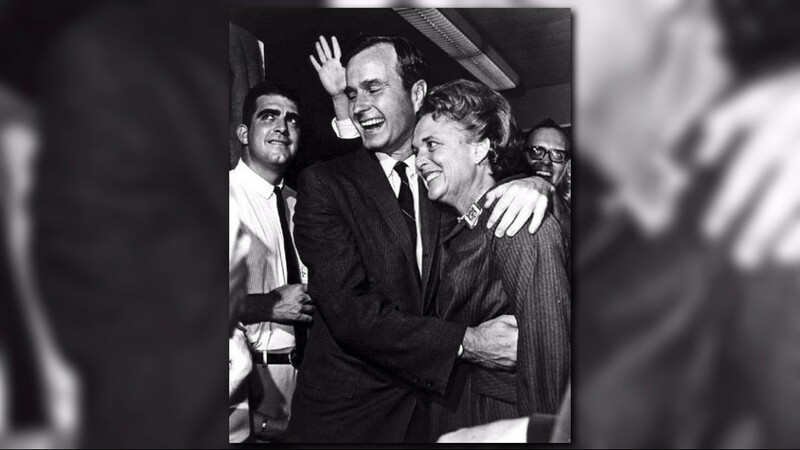 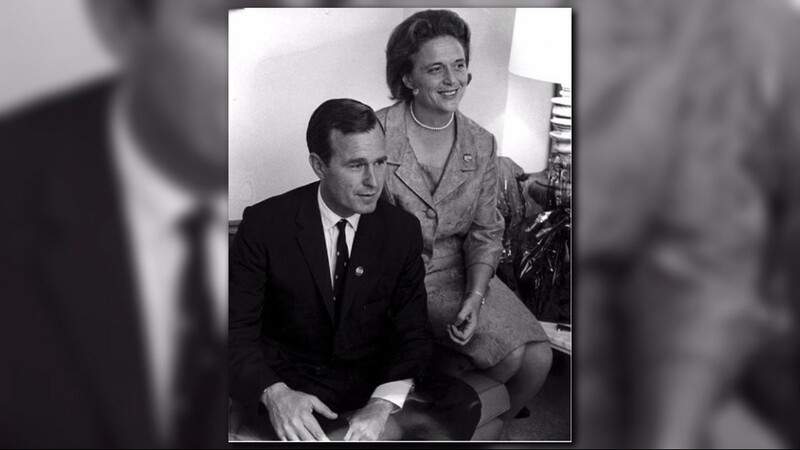 George and Barbara Bush on the night he was elected to Congress, 1966. 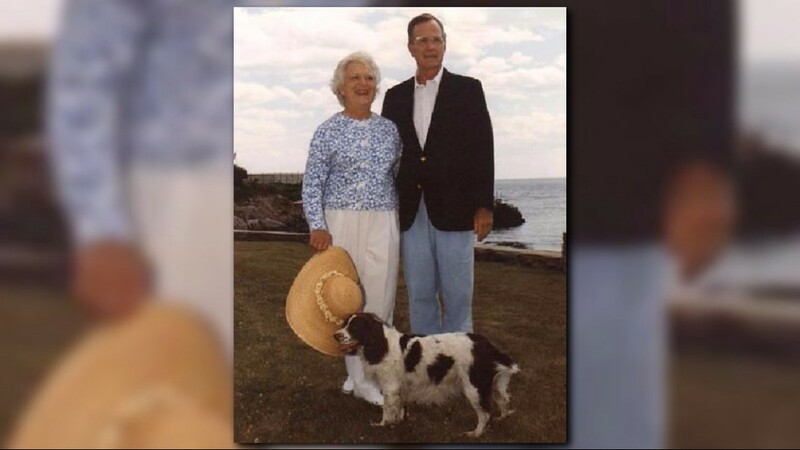 President and Mrs. Bush with Millie at Walker's Point, Kennebunkport, Maine, July 11, 1991. 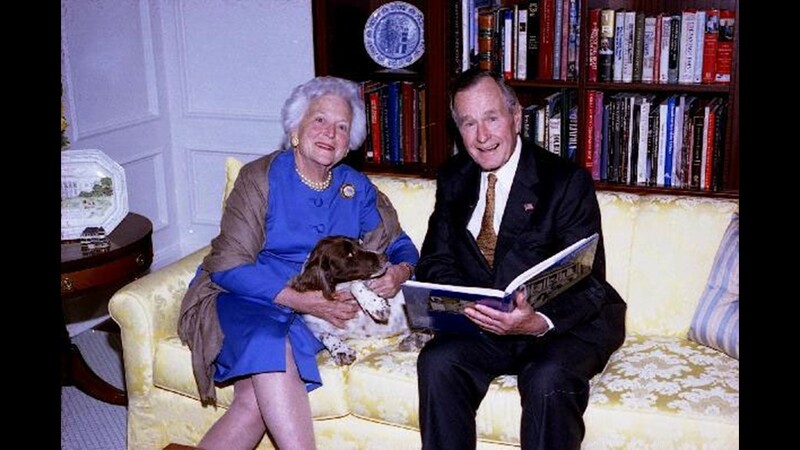 Former President and Mrs. Bush share a new book in their apartment at the George Bush Presidential Library Complex, February 28, 2002. 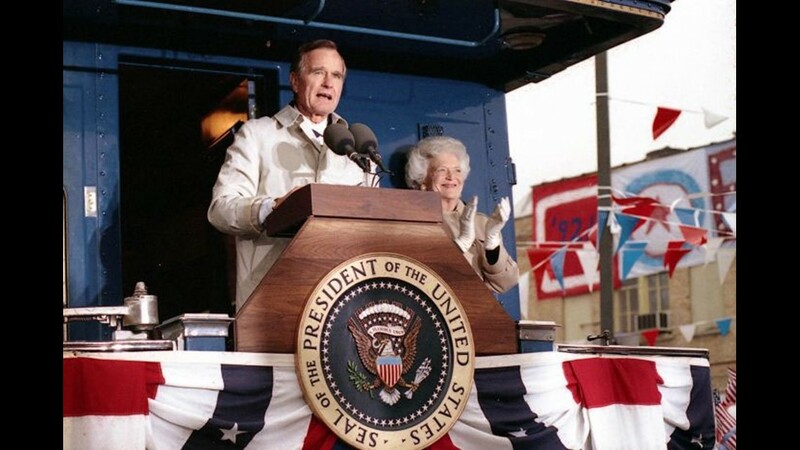 President and Mrs. Bush arrive the train station in Burlington, Wis., October 31, 1992. 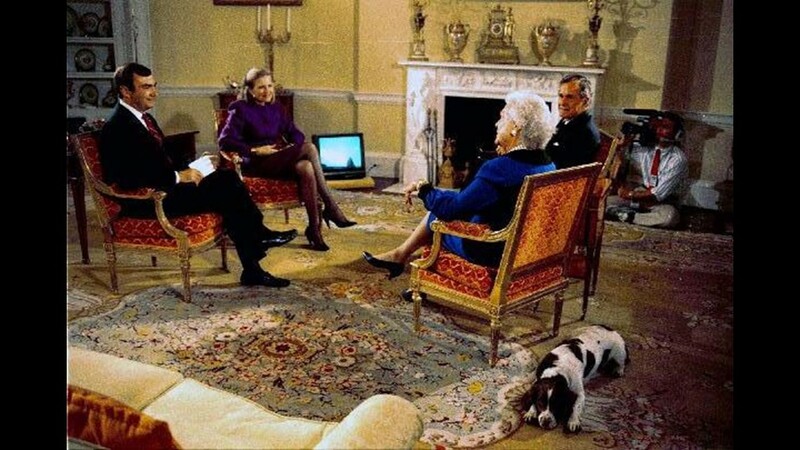 President and Mrs. Bush are interviewed in the Yellow Oval Room of the White House by Sam Donaldson and Diane Sawyer for Prime Time Live. 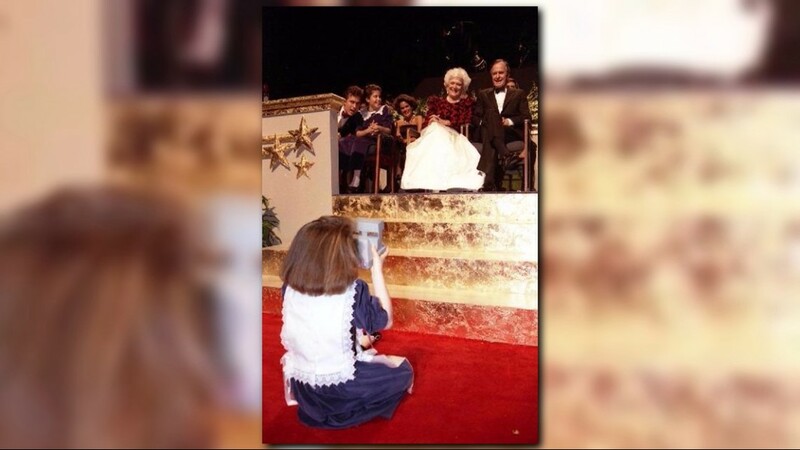 Millie waits quietly in the background, September 21, 1989. 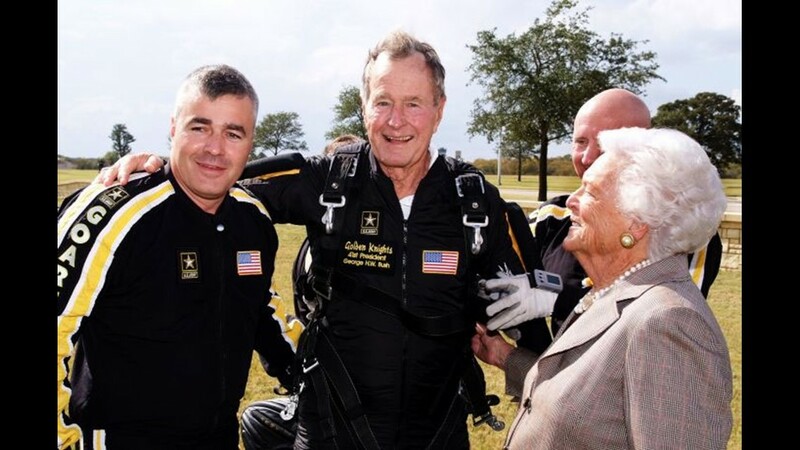 Former President Bush lands following a parachute jump for the 10th Anniversary and Rededication ceremonies of the George Bush Presidential Library and Museum, November 10, 2007. 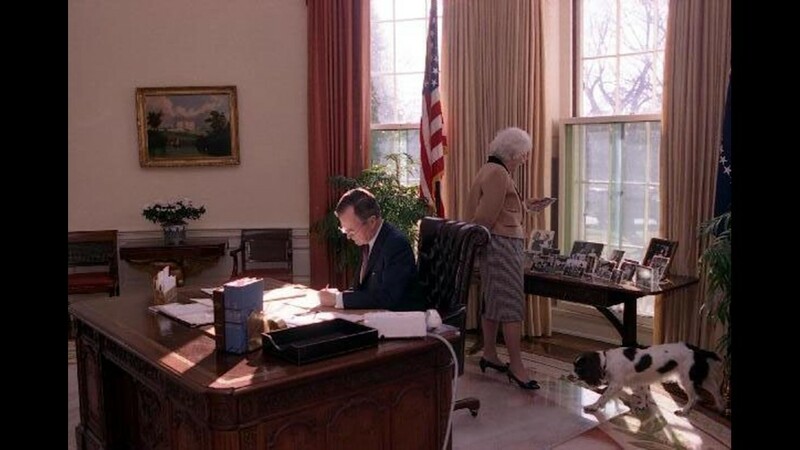 Mrs. Bush examines family photographs and Millie paces the floor as President Bush works at his desk in the Oval Office, January 27, 1989. 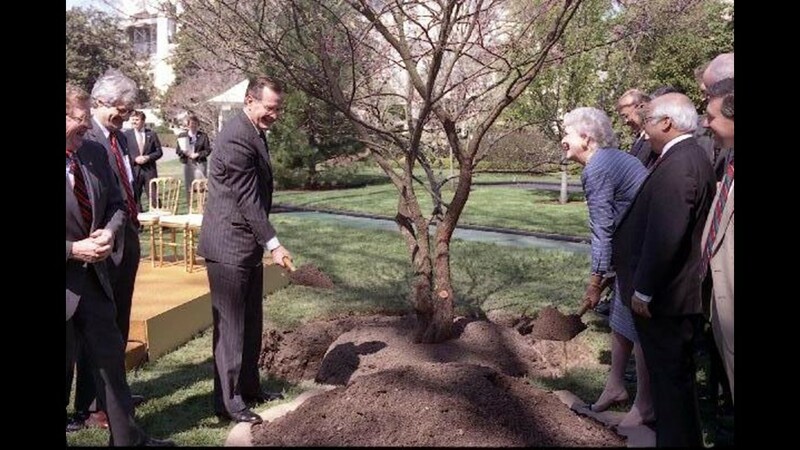 President and Mrs. Bush participate in a tree planting ceremony on the south lawn of the White House after he signs a transmittal letter to Congress entitled "National Tree Trust Act of 1990," March 22, 1990. 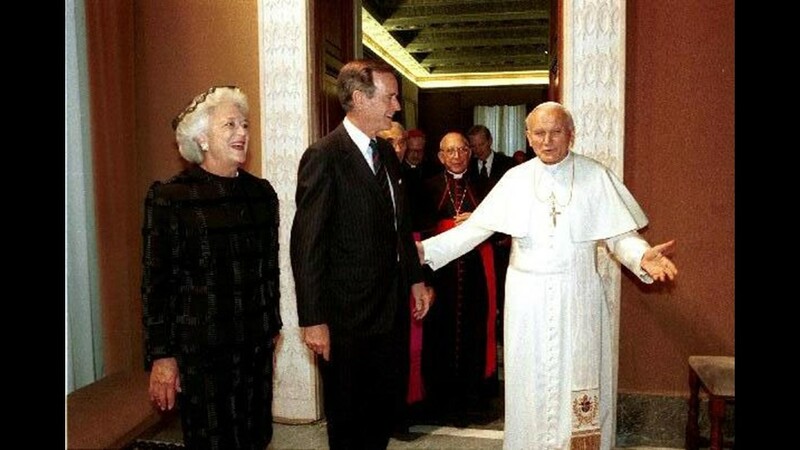 President and Mrs. Bush with the Pope, Vatican City, May 27, 1989. 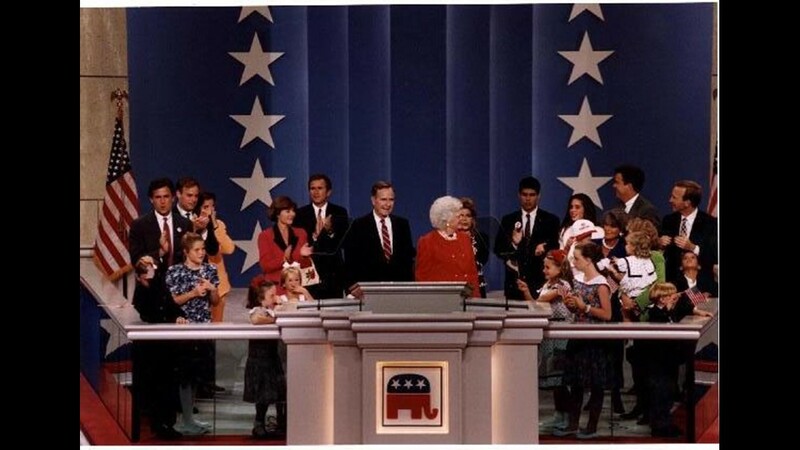 Mrs. Bush delivers an address at the Republican National Convention, August 19, 1992. 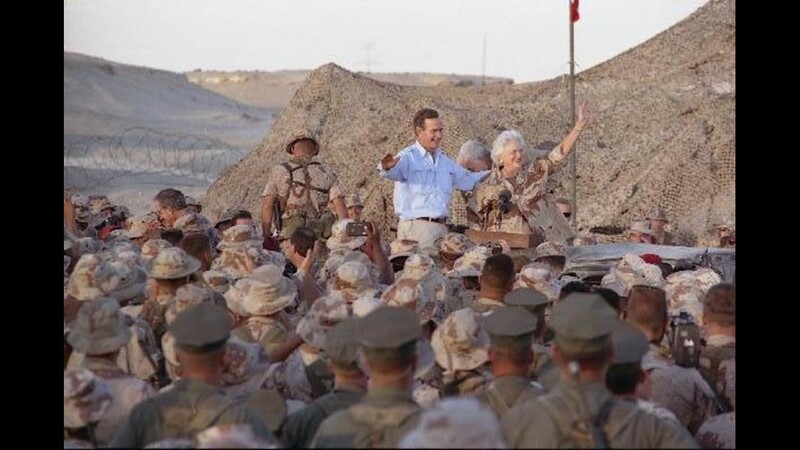 President and Mrs. Bush greet troops and have Thanksgiving Day dinner with the First Division Marine Command Post, Saudi Arabia, November 22, 1990. 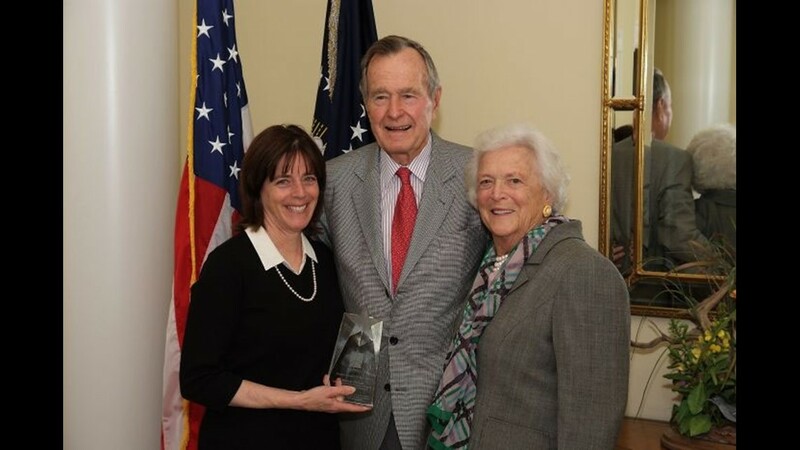 President and Mrs. Bush with astronaut Barbara Morgan, recipient of the Challenger Center's George Bush Award, March 19, 2008. 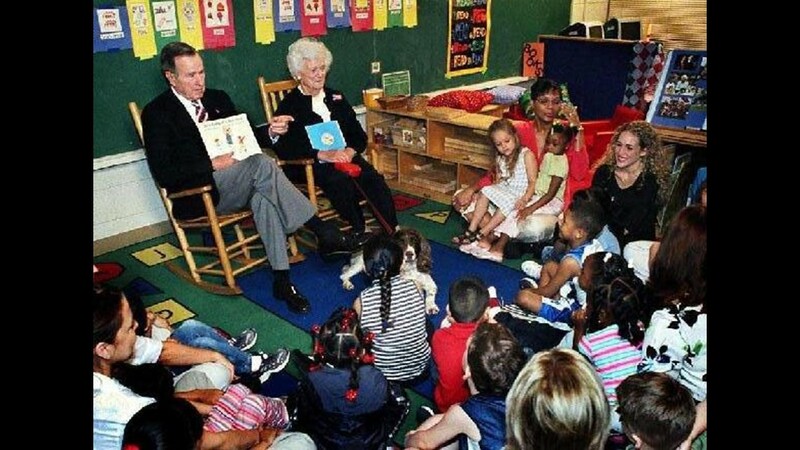 Former President and Mrs. Bush read to school children at Carver Early Learning Center, Bryan, Texas, March 17-18, 2003. 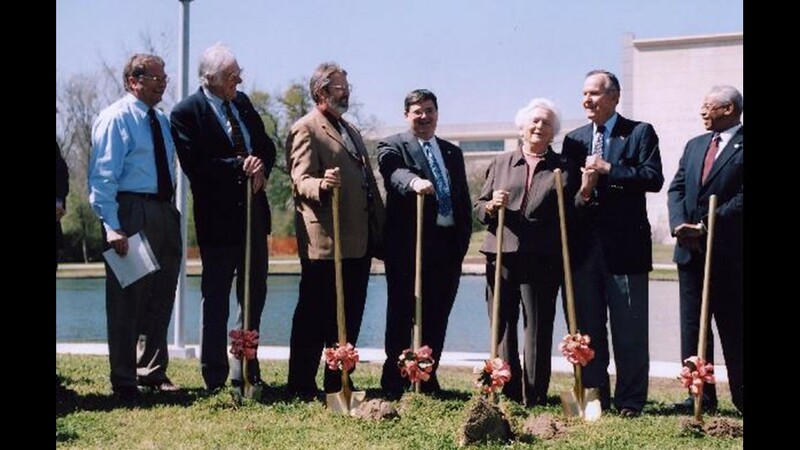 Groundbreaking Ceremony for the Barbara Bush Rose Garden at the George Bush Presidential Library, March 11, 2005. 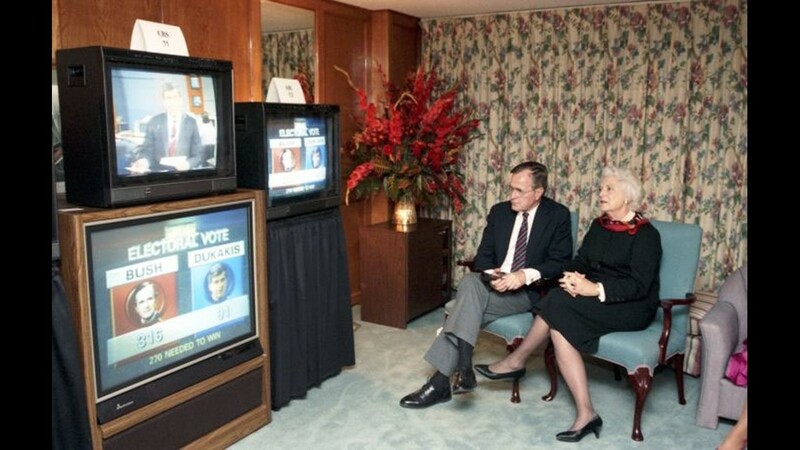 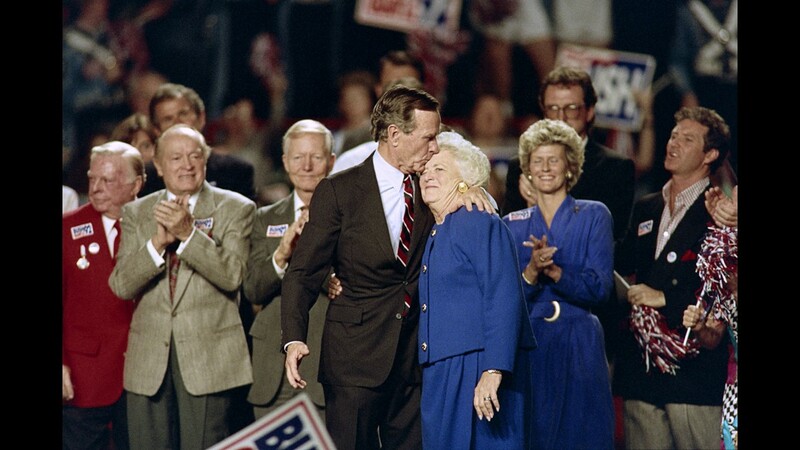 Vice President and Mrs. Bush watching the election results in Houston, Texas, November 8, 1988. 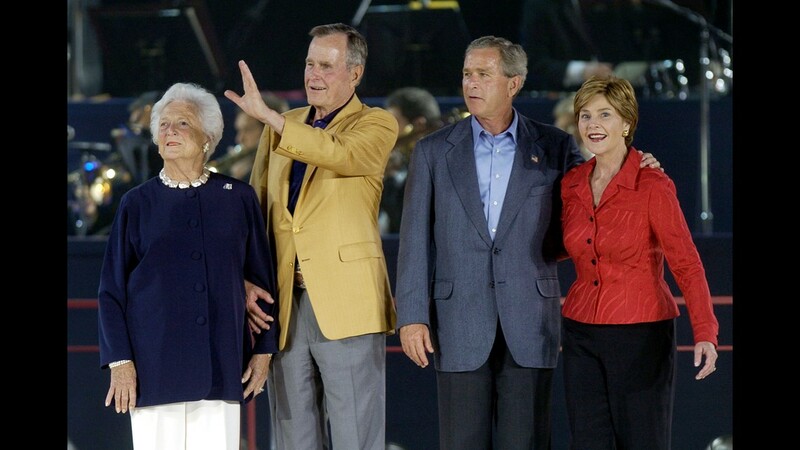 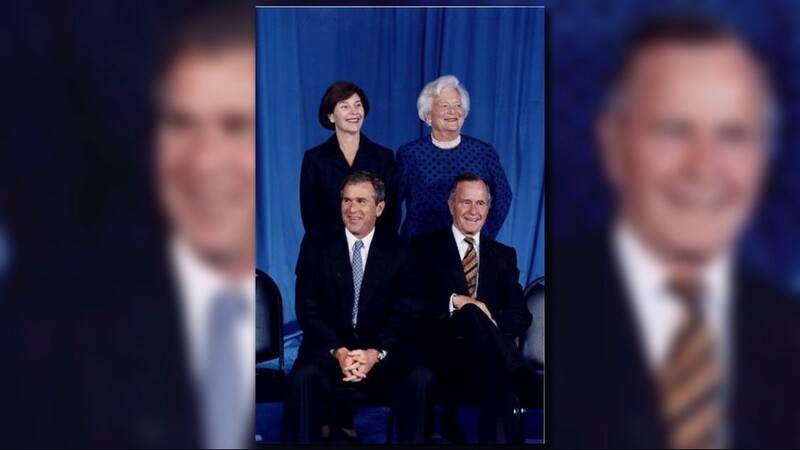 75th Birthday Celebration for Former President George Bush (clockwise: Laura, Barbara, George, and George W. Bush), June 10, 1999. 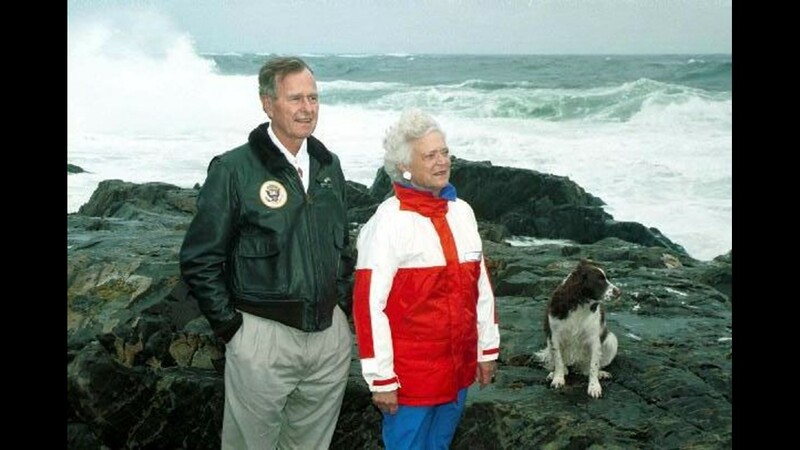 President and Mrs. Bush stand on the rocks with Millie outside their home at Walker's Point, Kennebunkport, Maine, August 10, 1991. 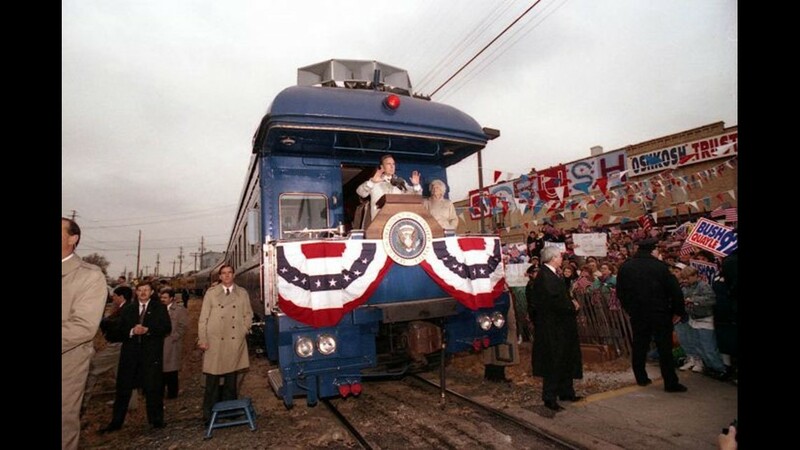 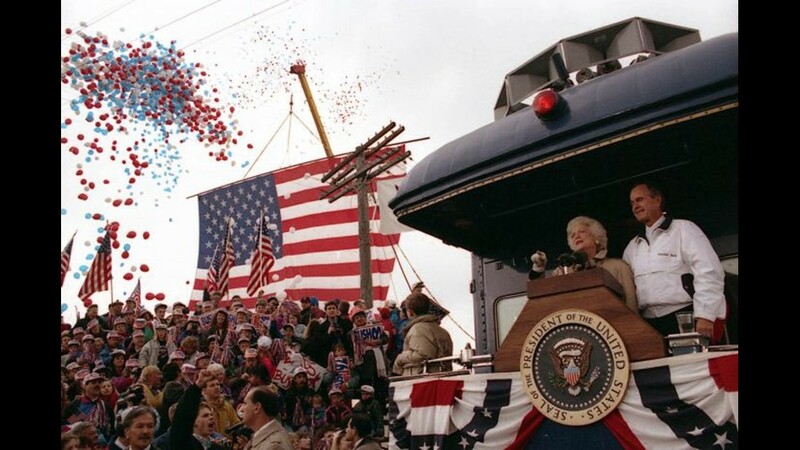 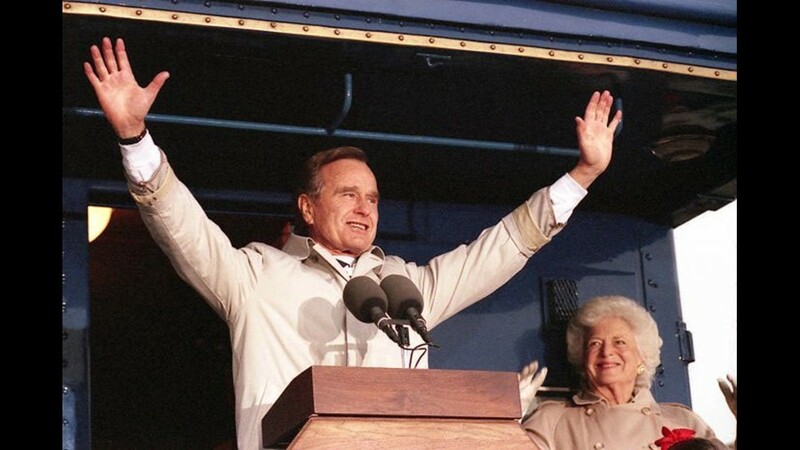 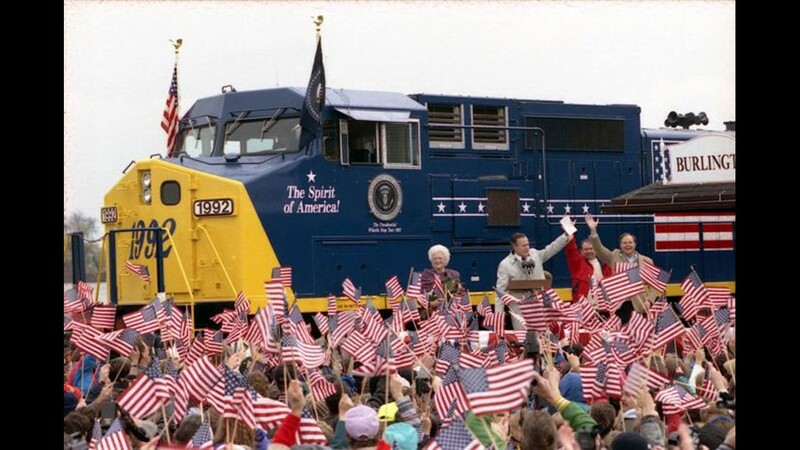 President and Mrs. Bush are greeted by the citizens of Sussex, Wisconsin, as they stand on the back of the "Spirit of America" campaign train, October 31, 1992. 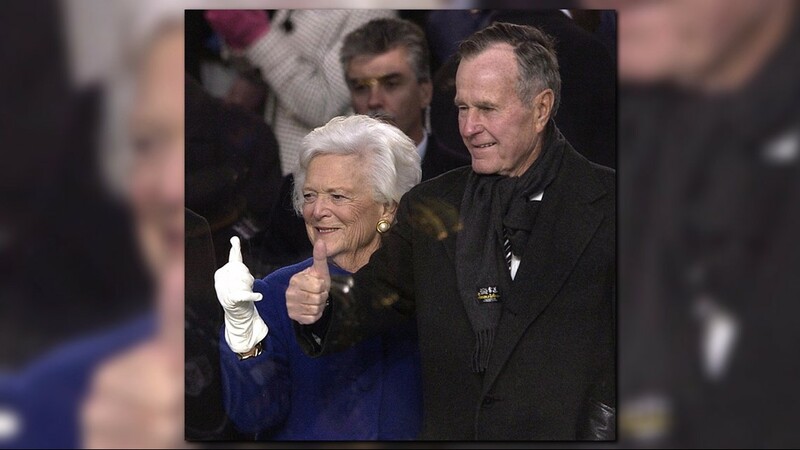 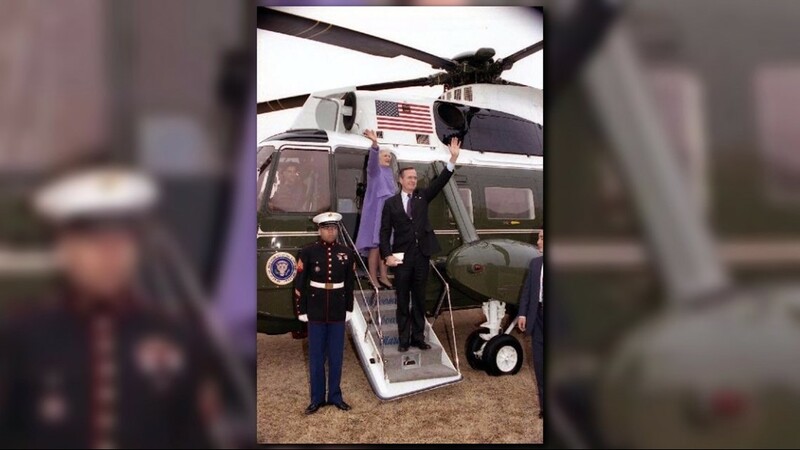 President and Mrs. Bush wave from the steps of Marine One, February 27, 1989. 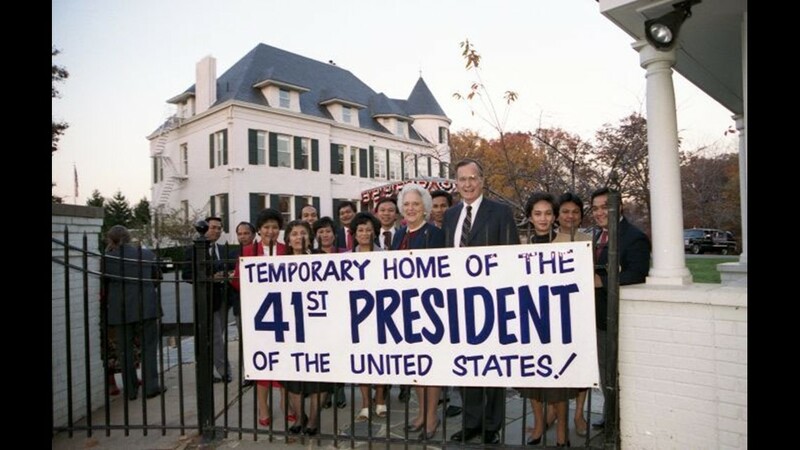 Vice President and Mrs. Bush at the Vice President's home at the Naval Observatory the day after the VP wins the election, November 9, 1988. 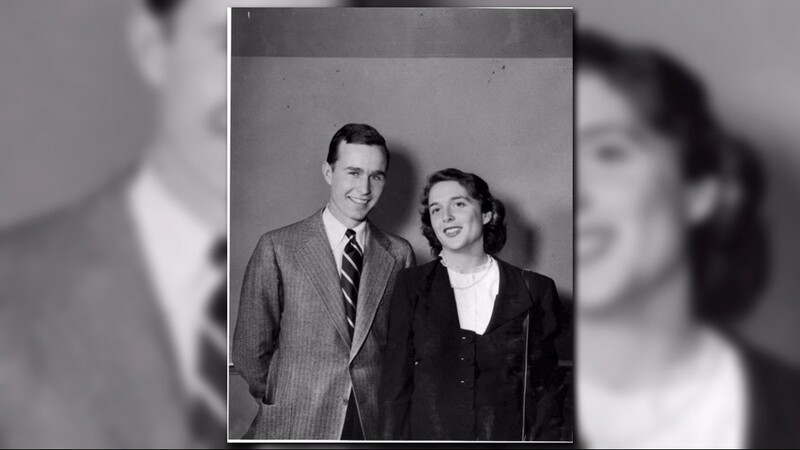 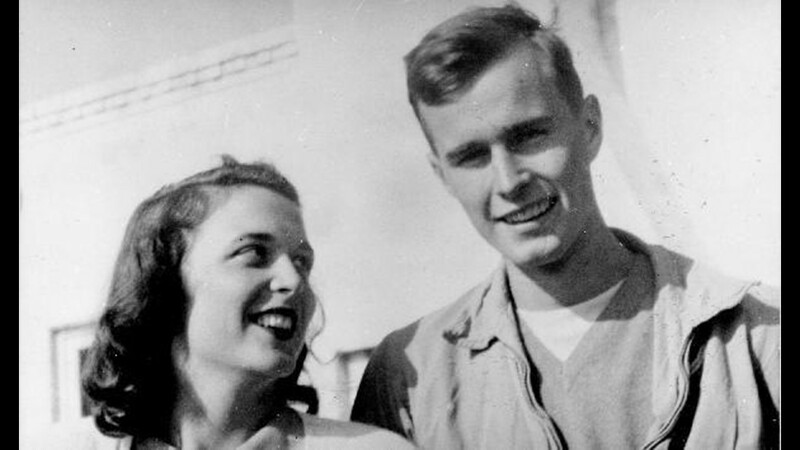 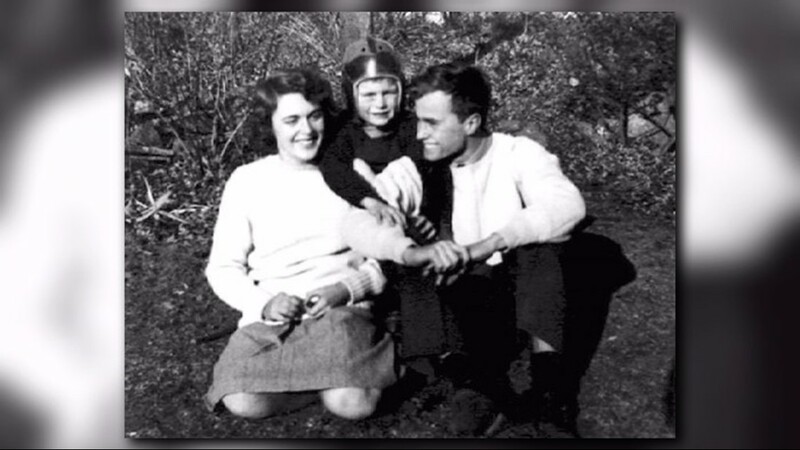 George and Barbara Bush, April 10, 1947. 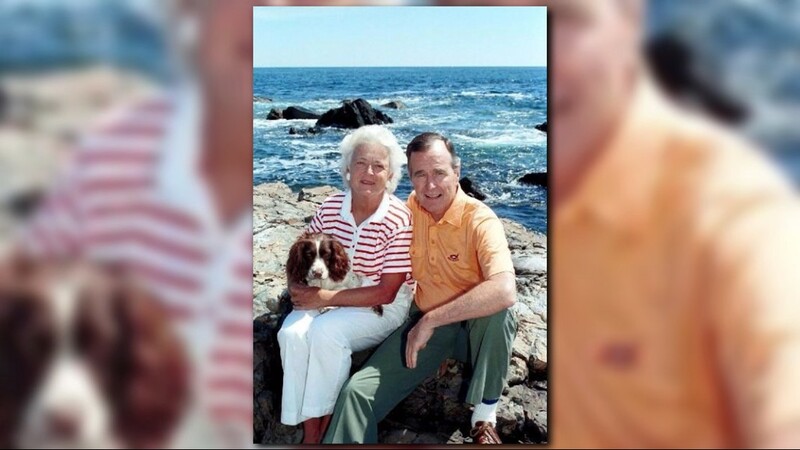 President and Mrs. Bush with Millie on the rocks at Walker's Point, Kennebunkport, Maine, August 18, 1989. 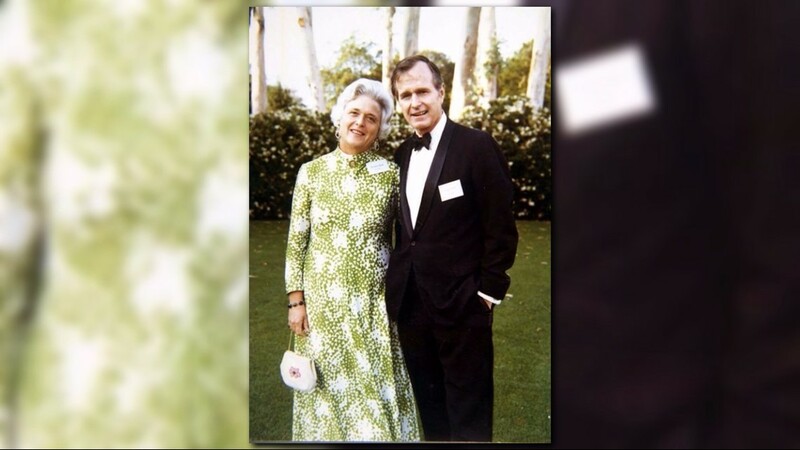 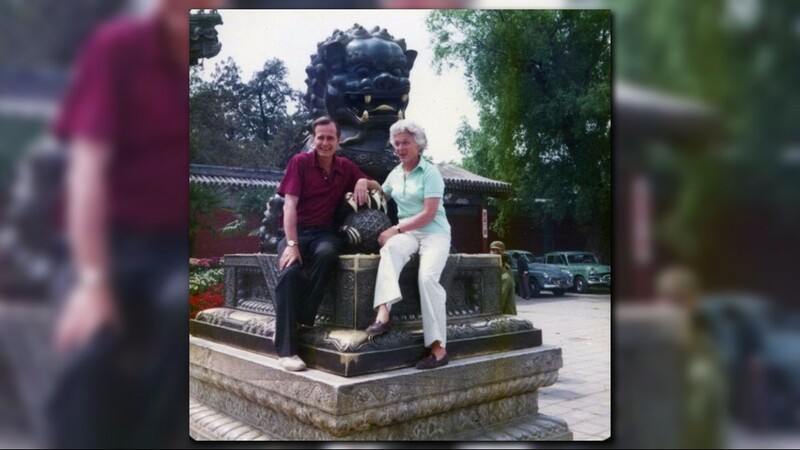 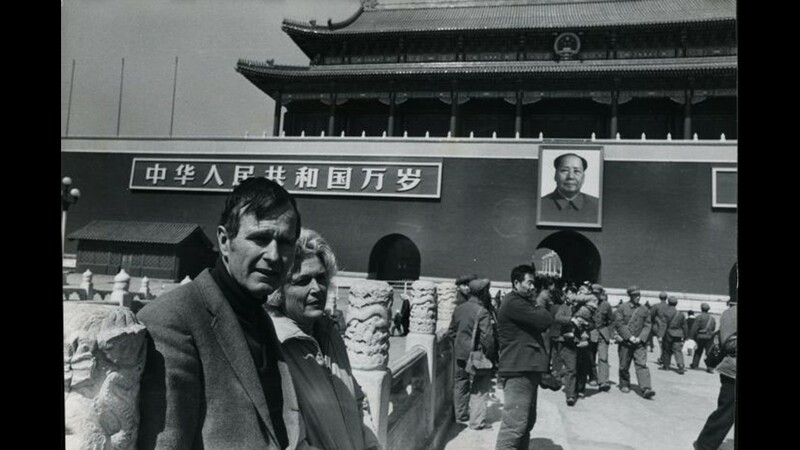 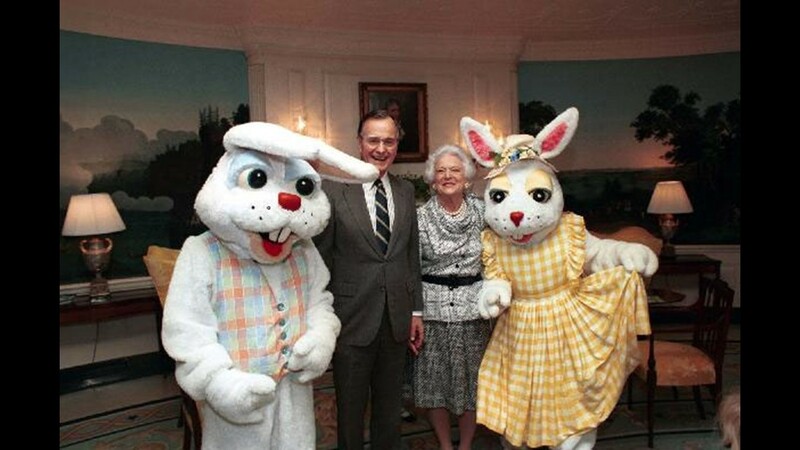 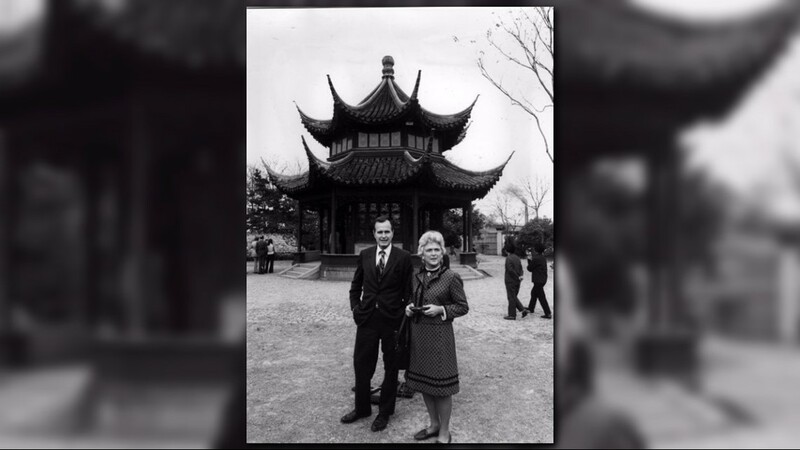 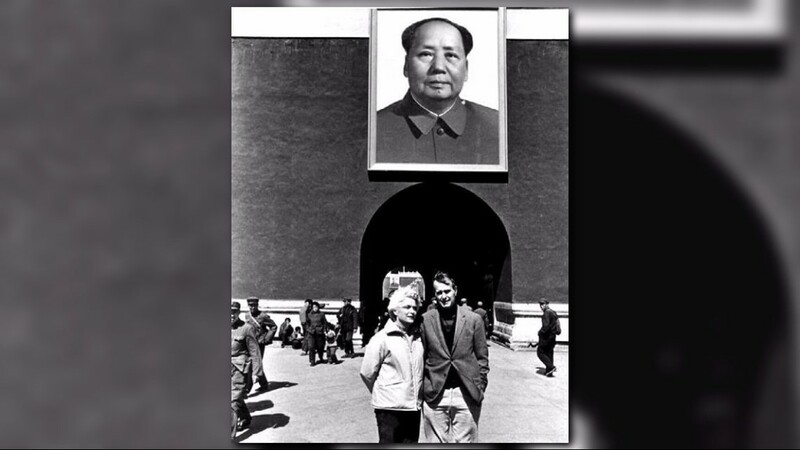 George and Barbara Bush in China when he was Chief of US Liaison Office, circa 1974. 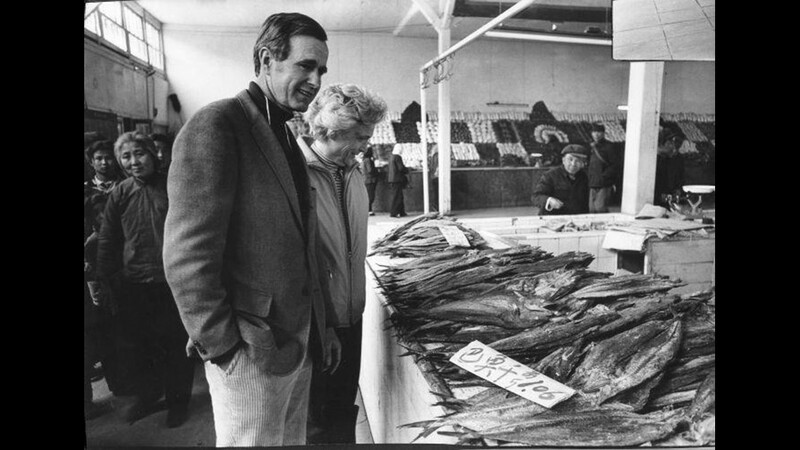 George and Barbara Bush inspect fish for sale at a local market while in China as the US Liaison, 1974-1976. 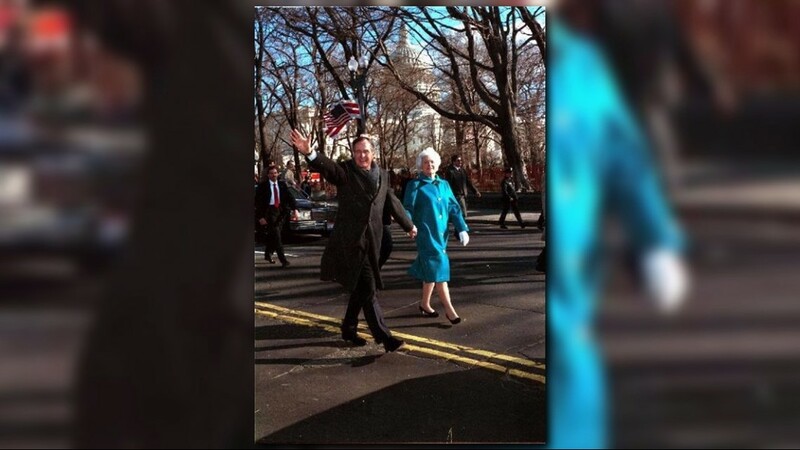 President and Mrs. Bush walking in Inaugural Parade, January 20, 1989. 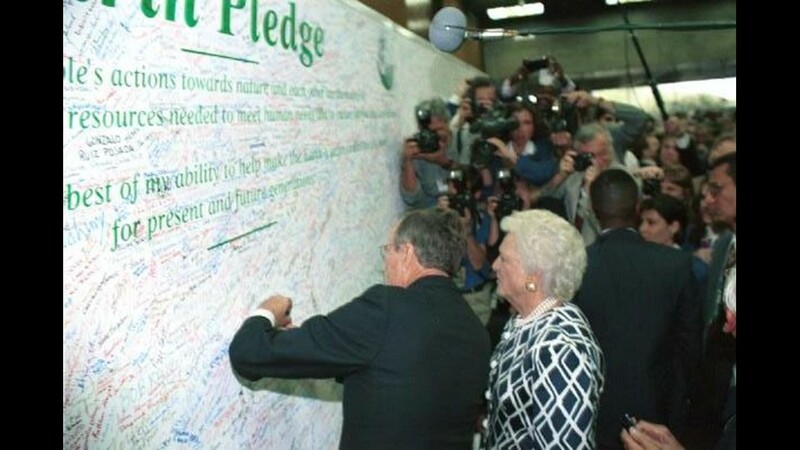 President and Mrs. Bush add their signatures to the "Earth Pledge" during the UN Environmental Conference in Rio de Janeiro, Brazil, January 12, 1992. 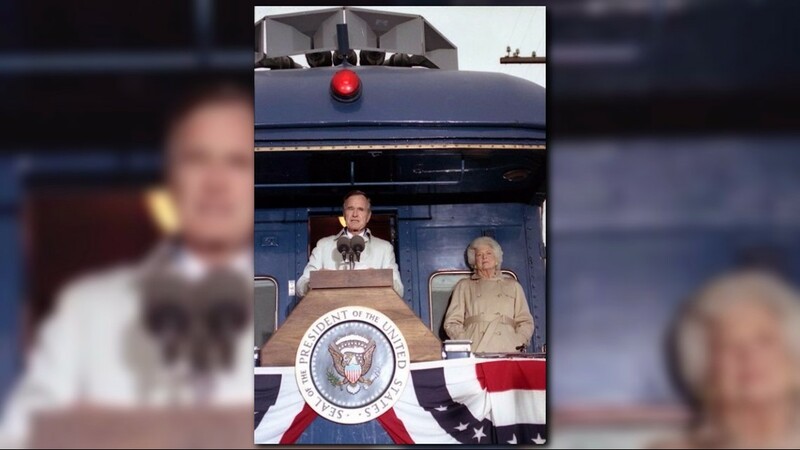 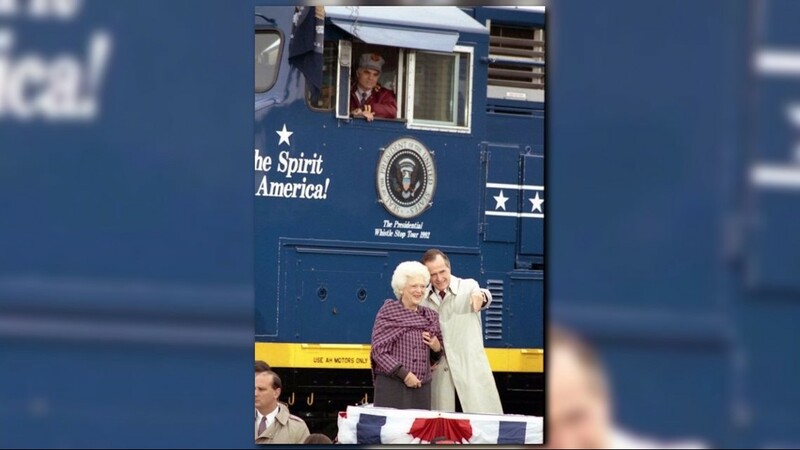 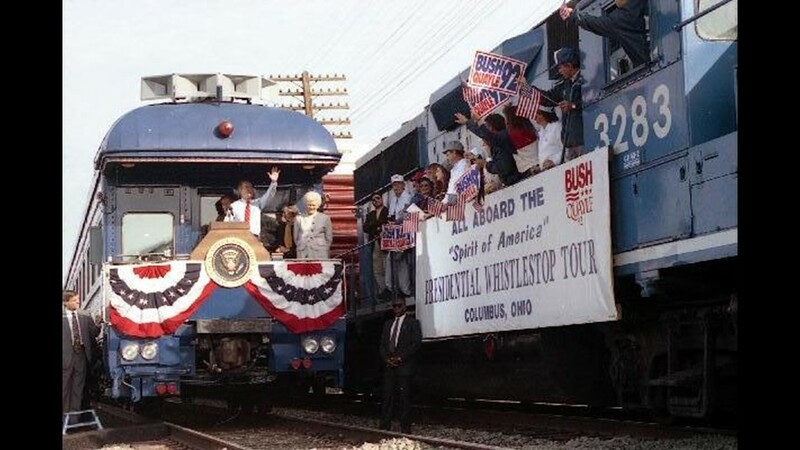 President and Mrs. Bush make a campaign whistle stop tour on the train, "Spirit of America," across Ohio, September 26, 1992. 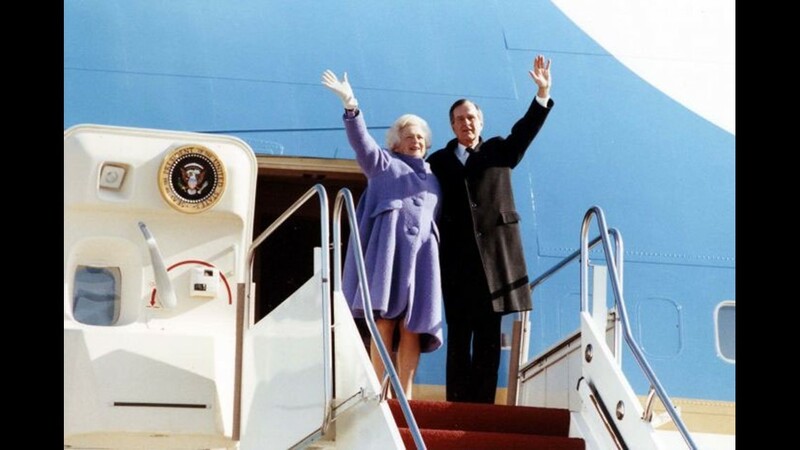 President and Mrs. Bush wave goodbye to President Ali Abdallah Saleh of Yemen Arab Republic, January 24, 1990. 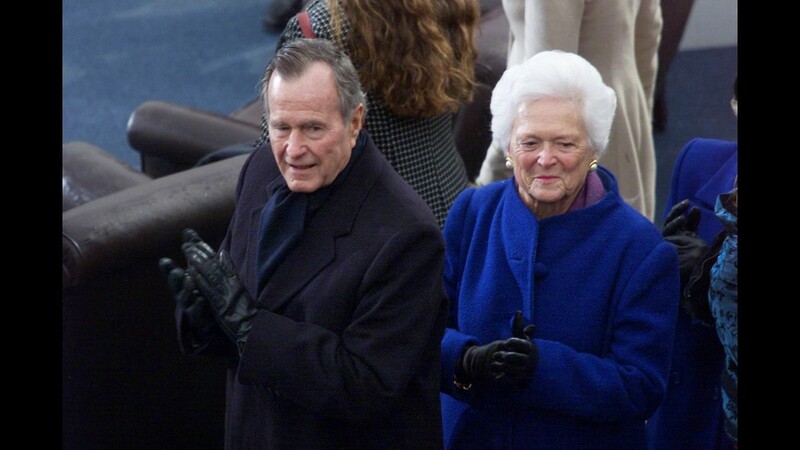 President and Mrs. Bush enjoy inaugural activities, January 20, 1989. 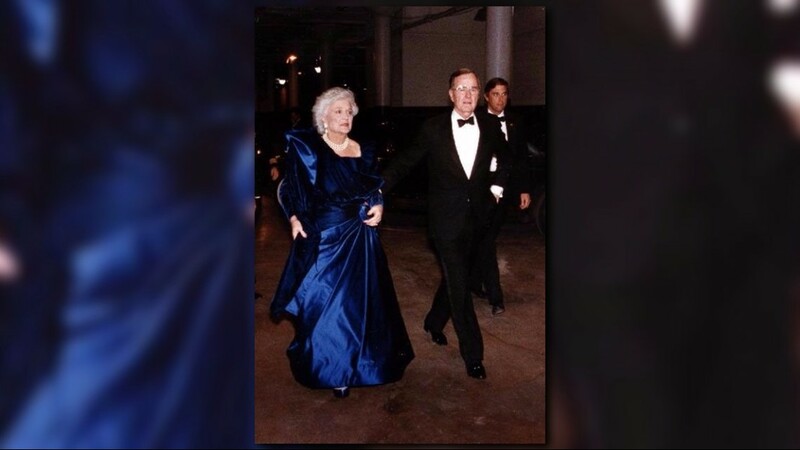 President and Mrs. Bush on their way to attend an Inaugural Ball at the DC Armory, January 20, 1989. 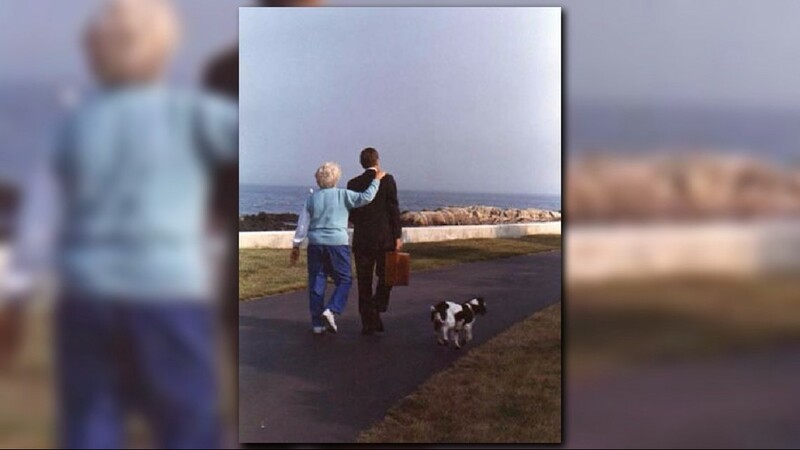 President and Mrs. Bush walk down the driveway as Millie trots alongside, Walker's Point, Kennebunkport, Maine, August 16, 1989. 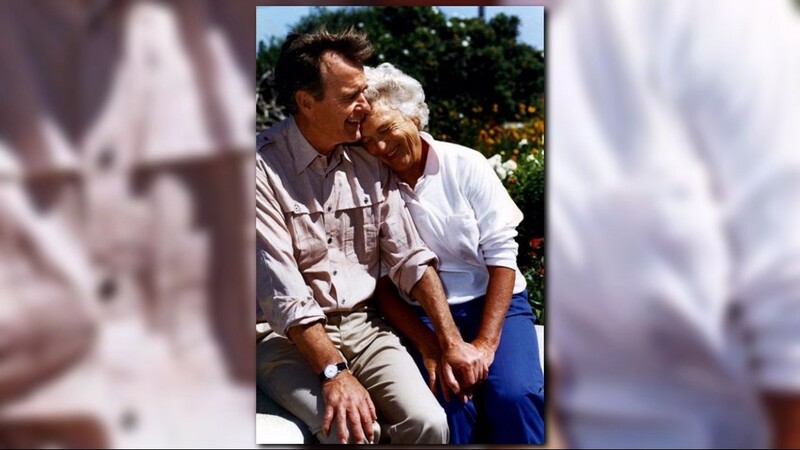 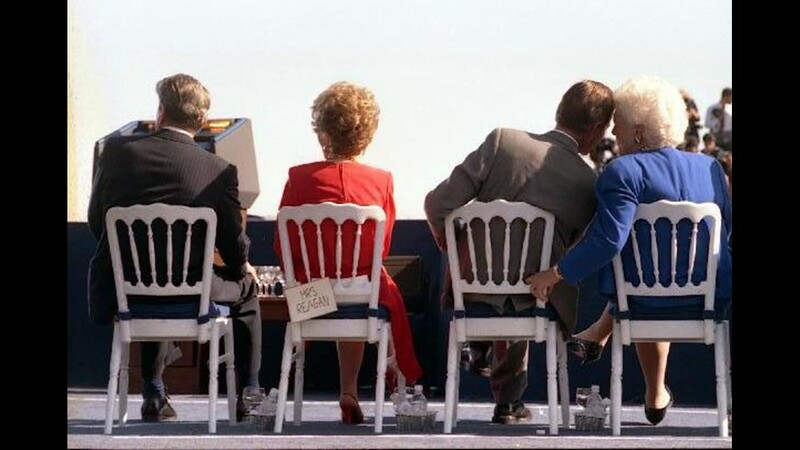 President and Mrs. Bush share a private moment during the Dedication of the Ronald Reagan Presidential Library in Simi Valley, Calif., November 4, 1991. 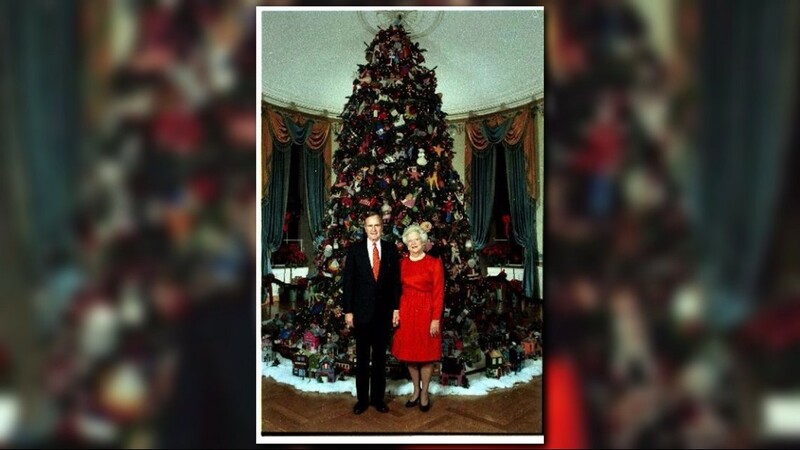 President and Mrs. Bush in front of the 1992 White House Christmas tree, December 8, 1992. 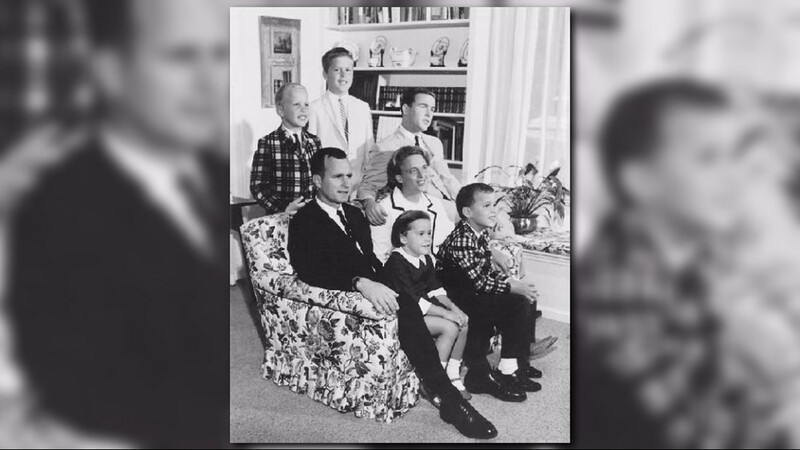 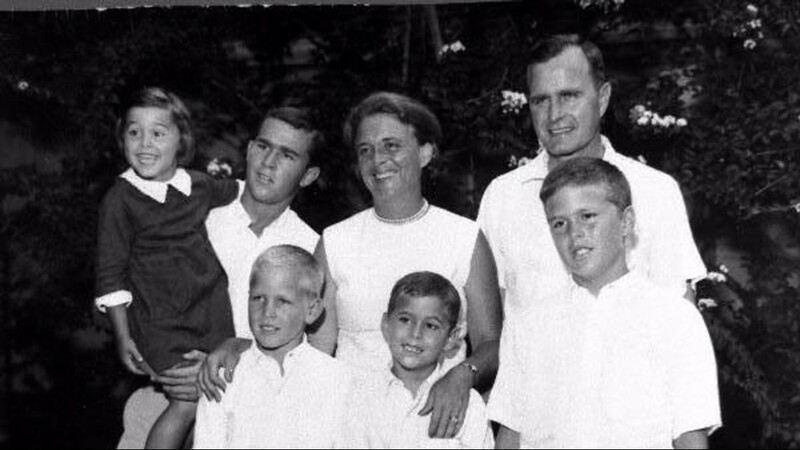 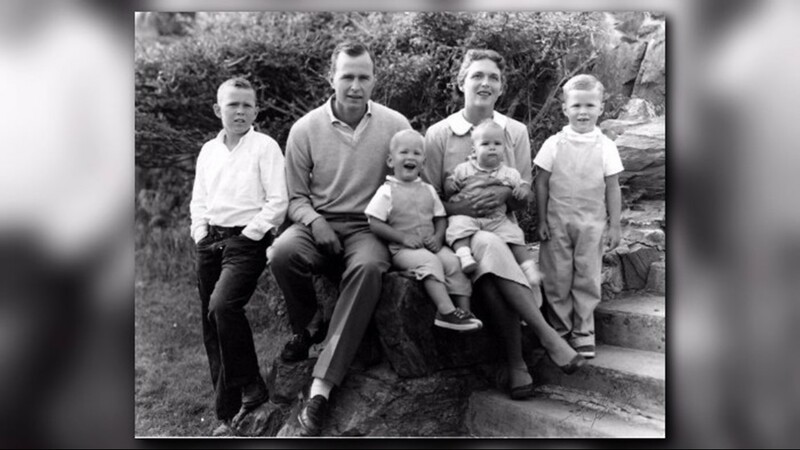 The George Bush family (l-r front row - Neil, Marvin, Jeb; back row - Doro, George W., Barbara, George), early 1960s. 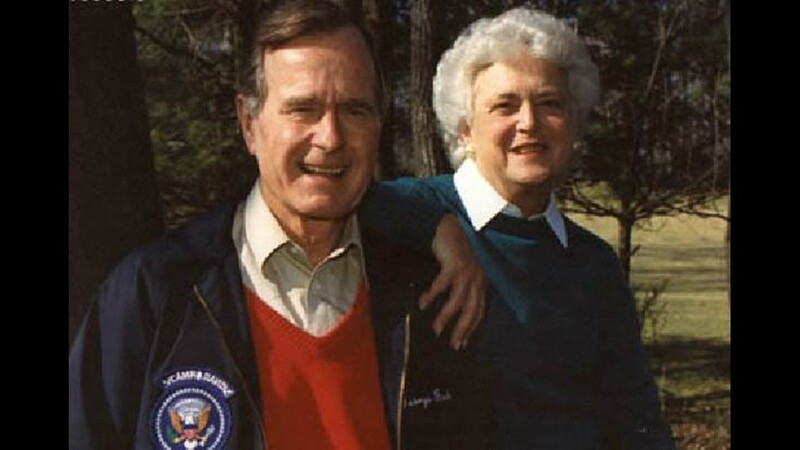 President and Mrs. Bush stand by a split rail wood fence on the ground of Camp David, March 10, 1990. 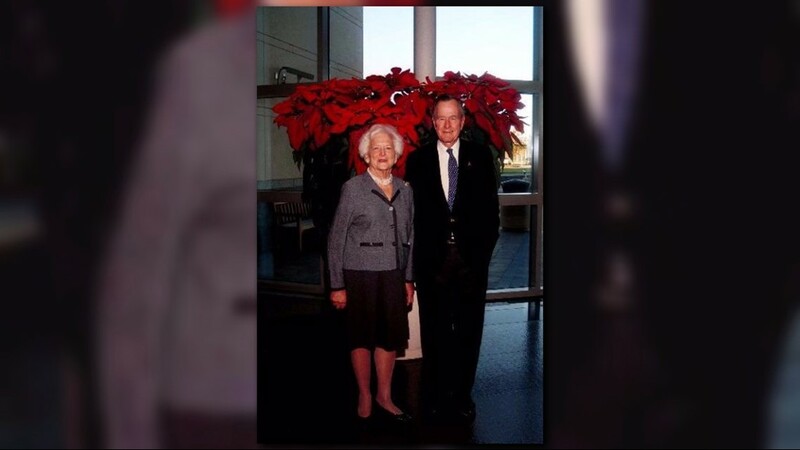 Former President and Mrs. Bush in front of the Library Christmas Poinsettia, December 13, 2002. 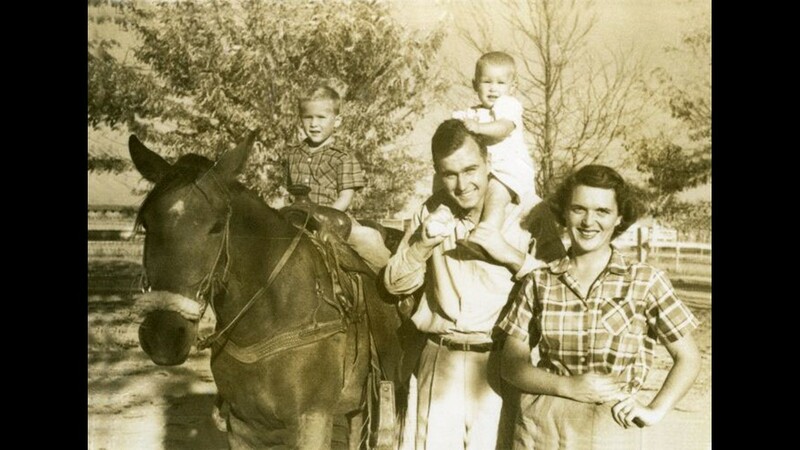 George W., George, Neil, Marvin being held by Barbara, and Jeb, Midland, Texas, circa 1957. 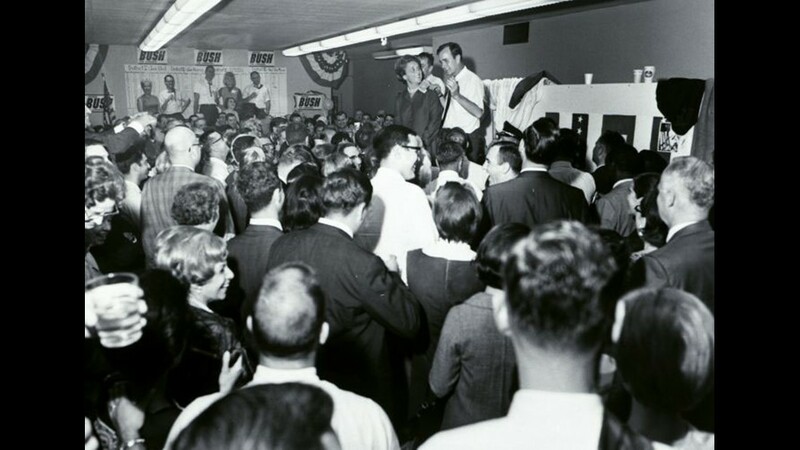 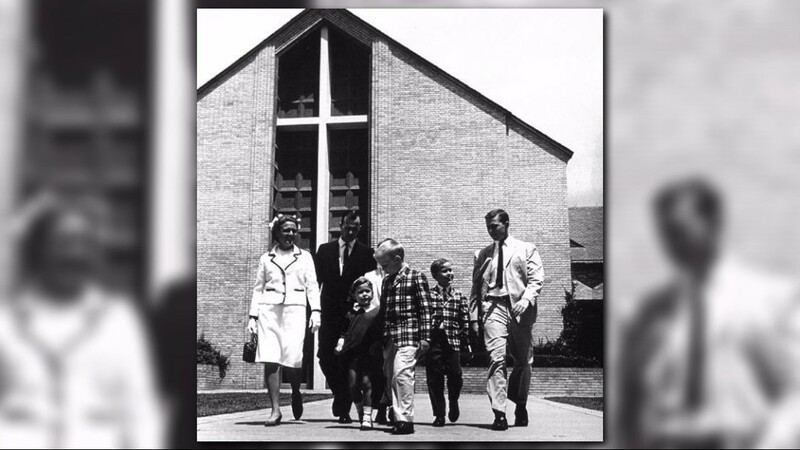 The Bush family attends church in Houston, TX (l-r Barbara, George, Jeb (hidden), Doro, Neil, Marvin, George W.), 1964. 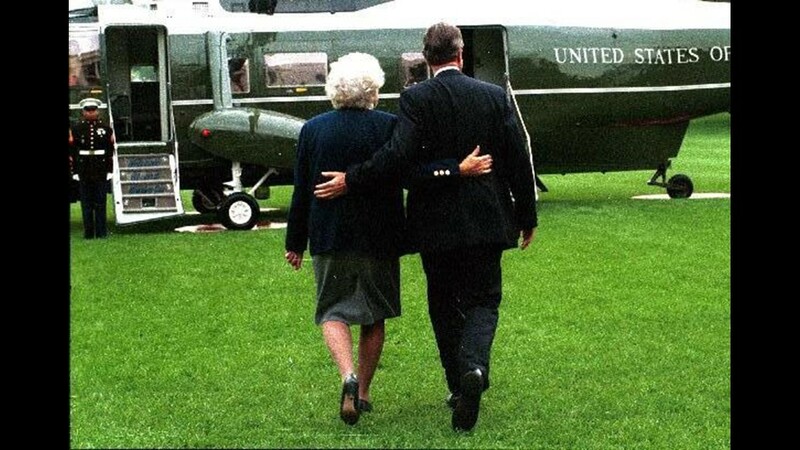 President and Mrs. Bush walk down the driveway at Walker's Point, Kennebunkport, Maine, August 22, 1990. 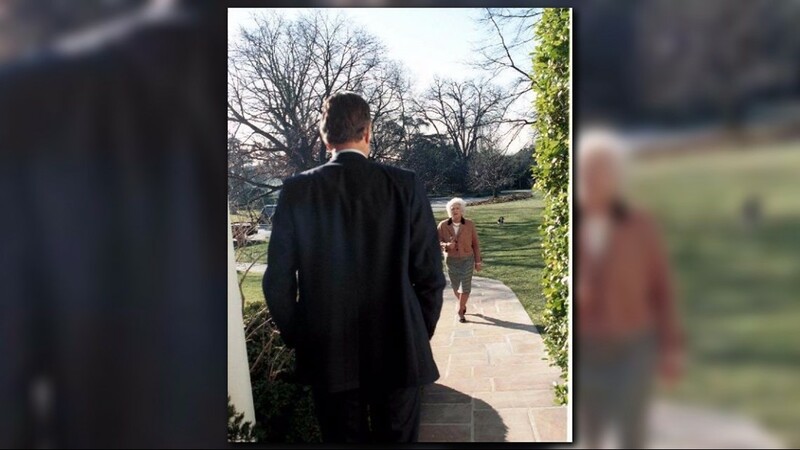 First Lady Barbara Bush walks toward her husband on the grounds of the White House, January 27, 1989. 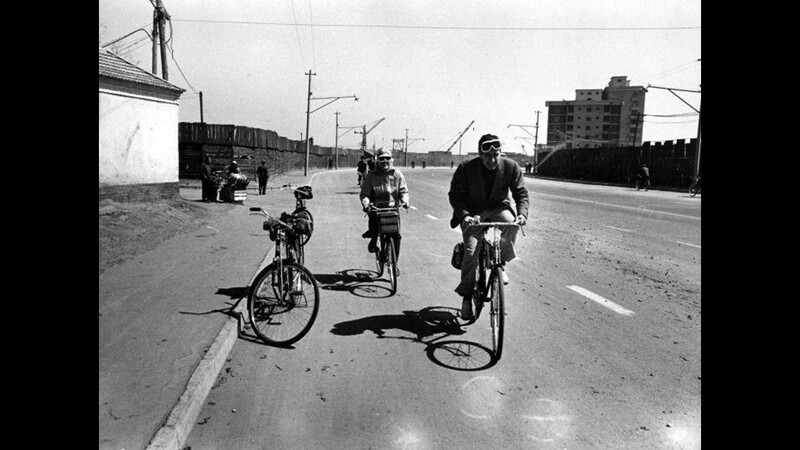 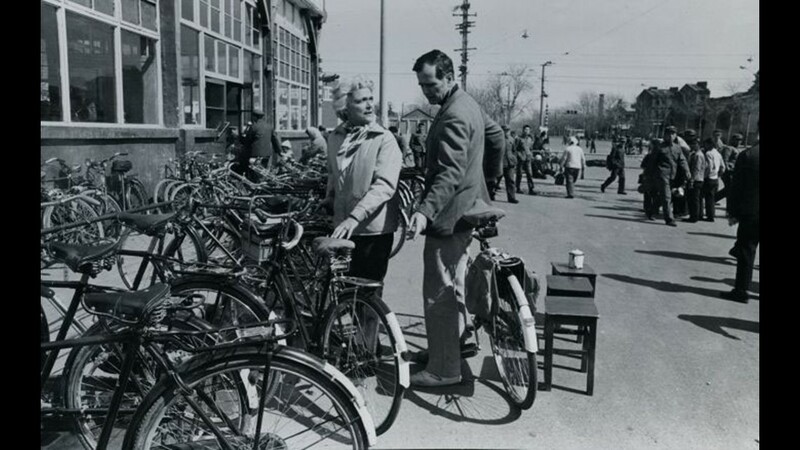 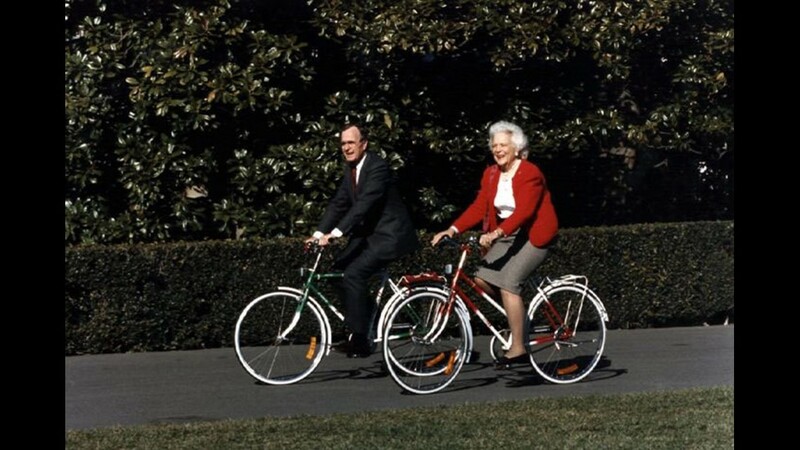 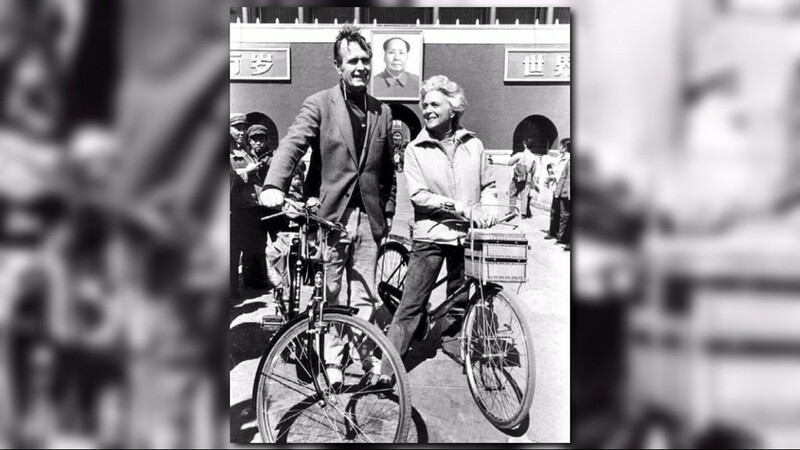 President and Mrs. Bush ride bicycles given them by the Chinese on the South Grounds of the White House, March 1, 1989. 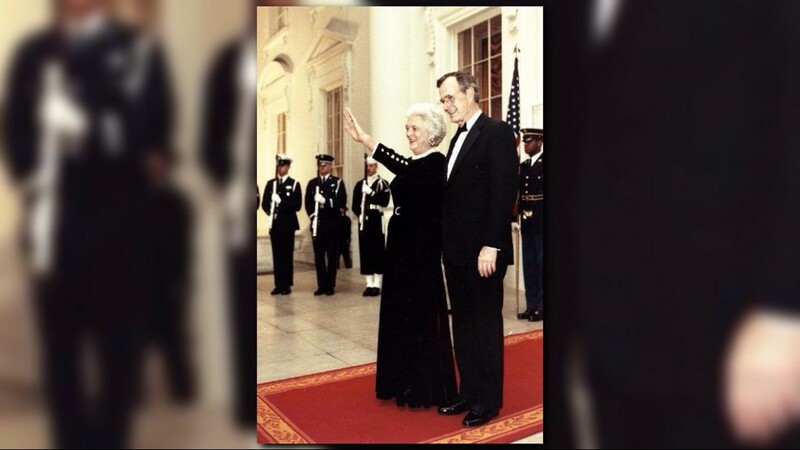 Vice President and Mrs. Bush have their picture taken by their granddaughter at the Inaugural Gala in Washington, D.C., January 19, 1989. 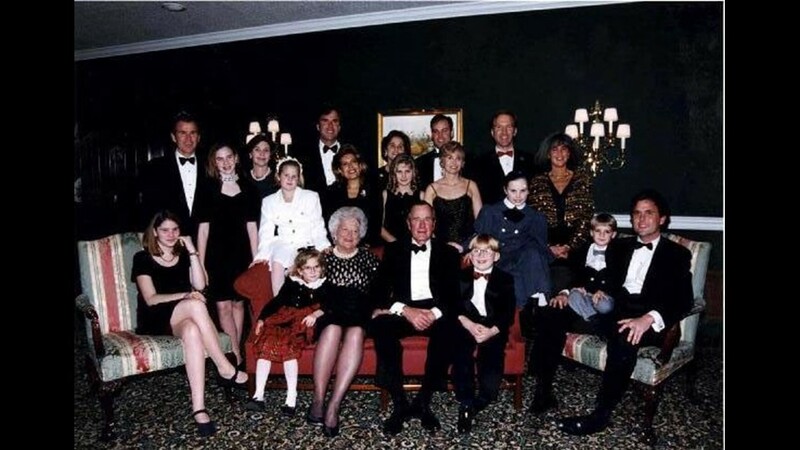 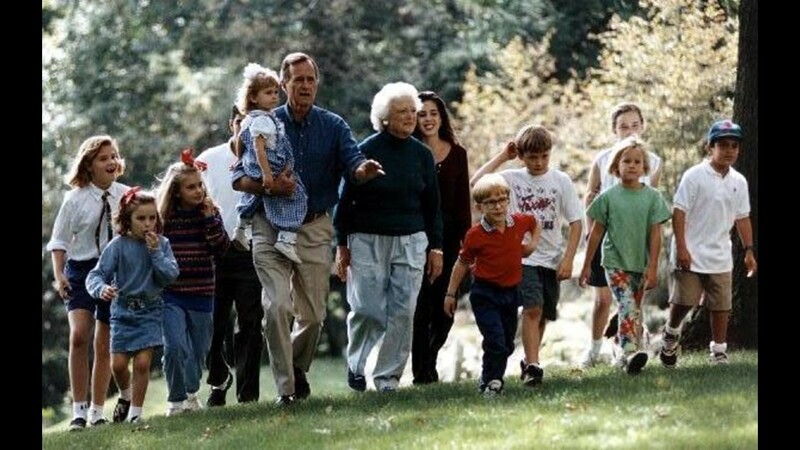 President and Mrs. Bush walk with their grandchildren at Camp David, September 19, 1992. 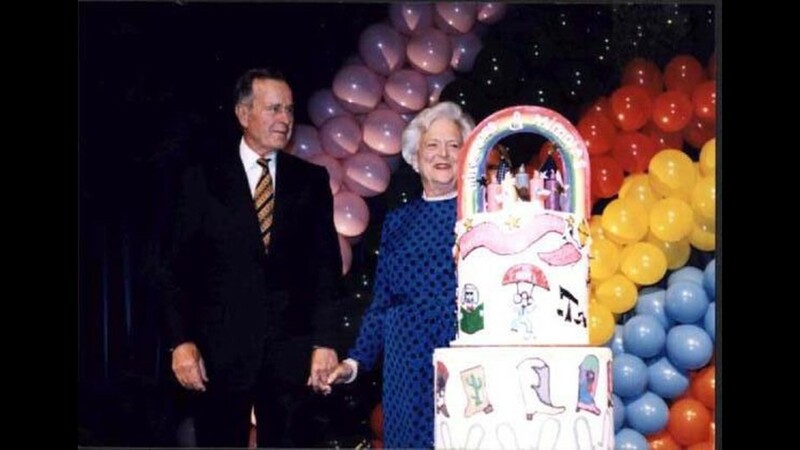 Former President and Mrs. George Bush celebrate his 75th birthday, June 10, 1999. 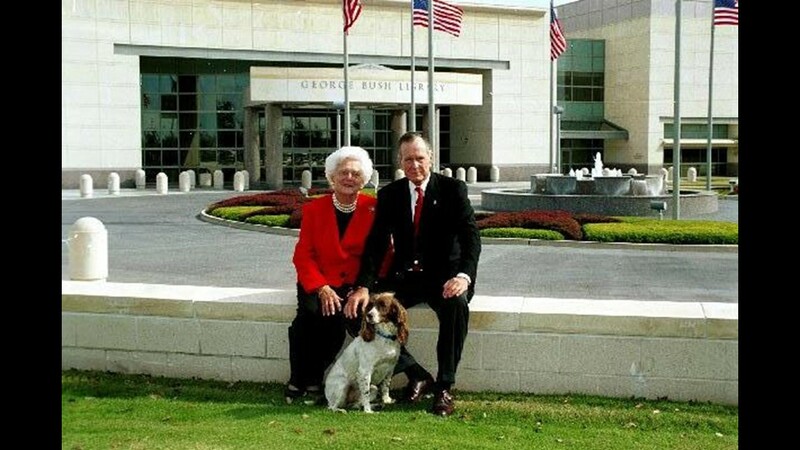 Former President and Mrs. Bush pose in front of the Library for their 2002 Christmas card photo with their dog, Sadie, November 8, 2002. 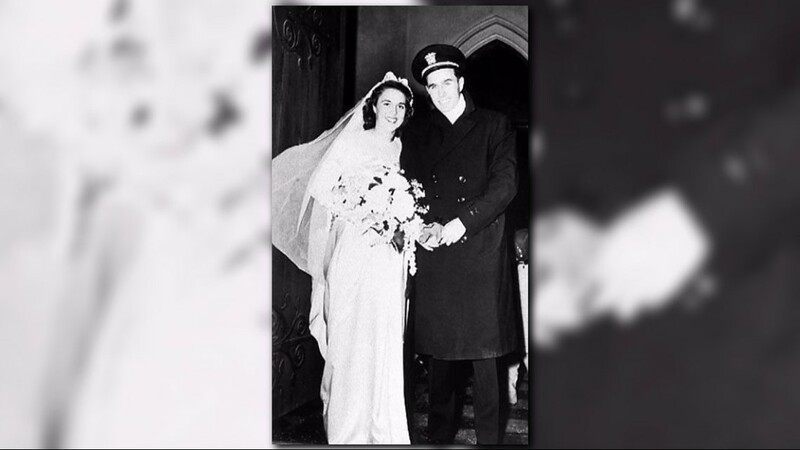 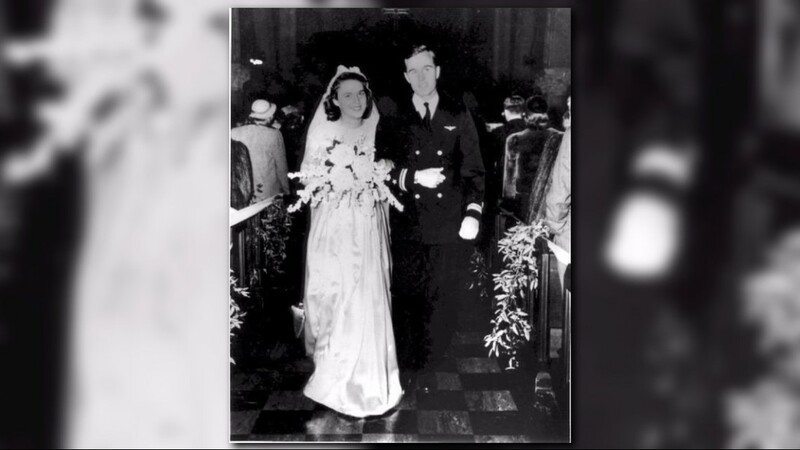 George and Barbara Bush on their wedding day in Rye, New York, January 6, 1945. 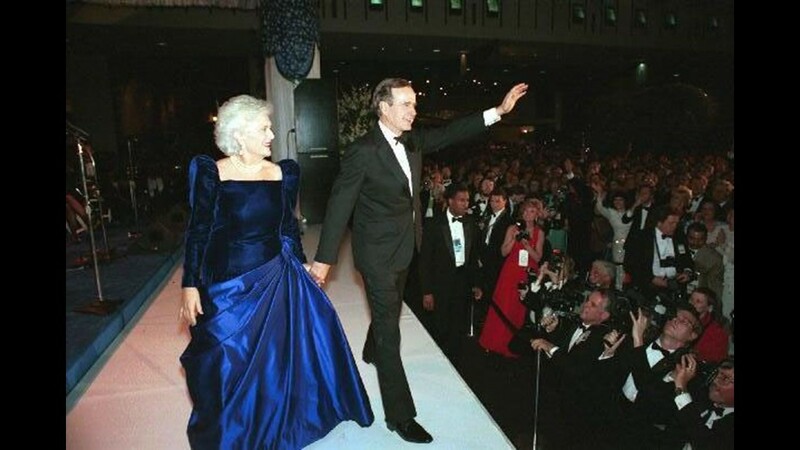 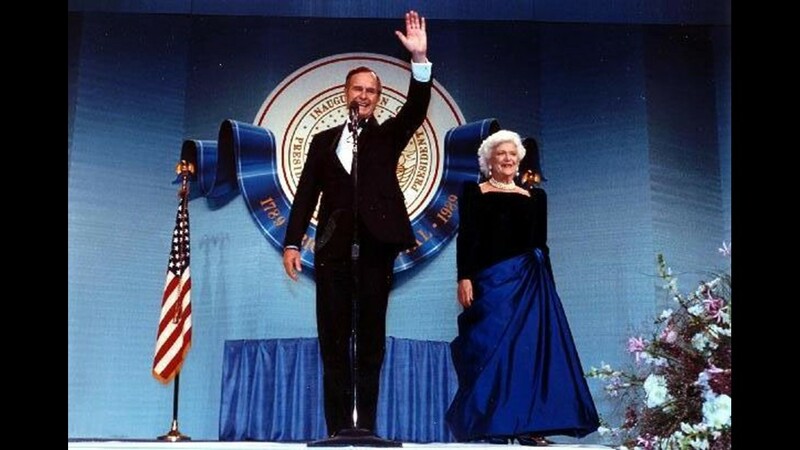 President and Mrs. Bush attend an Inaugural Ball at the DC Armory, January 20, 1989. 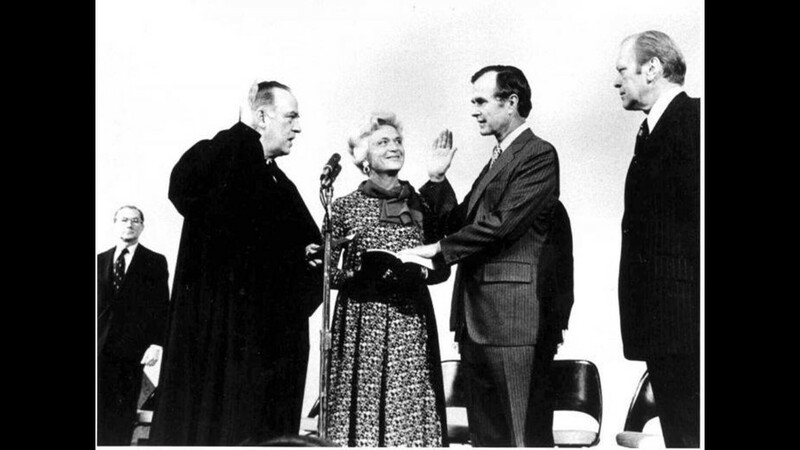 George Bush is sworn in as Director of CIA by Justice Potter Stewart as President Ford looks on, January 10, 1976. 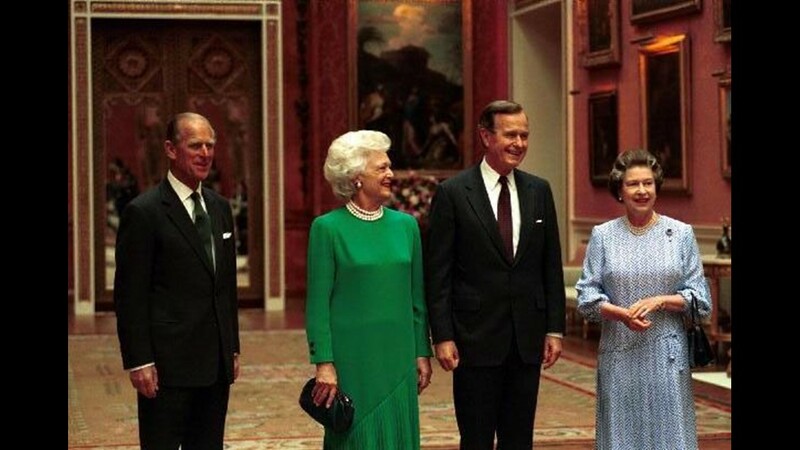 President and Mrs. Bush arrive Buckingham Palace where they are met by Queen Elizabeth and Prince Philip, London, England, June 1, 1989. 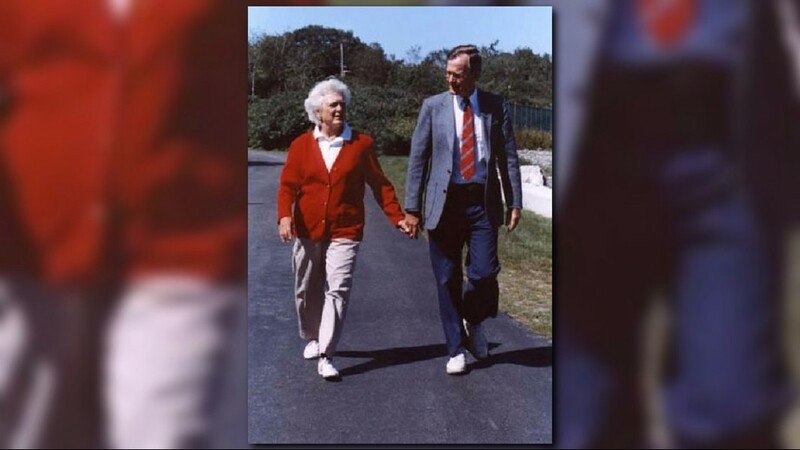 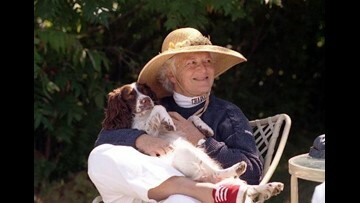 George and Barbara Bush at Walker's Point, Kennebunkport, Maine, August 6, 1988. 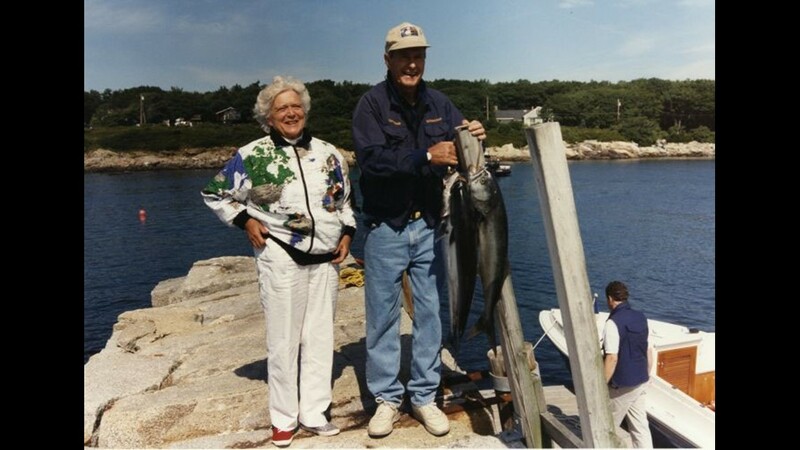 President and Mrs. Bush show their catch of the day, Walker's Point, Kennebunkport, Maine, August 7, 1991. 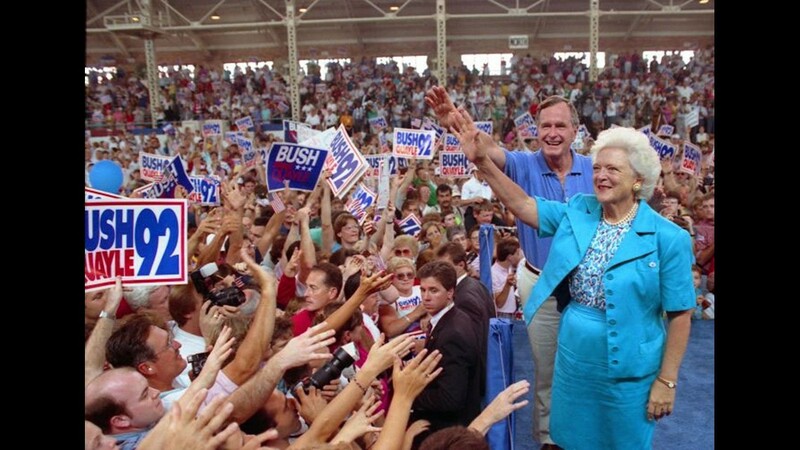 President and Mrs. Bush wave at supporters during the 1992 campaign stop at the Illinois Farm Exposition at the State Fair Coliseum, Springfield, Ill., August 23, 1992. 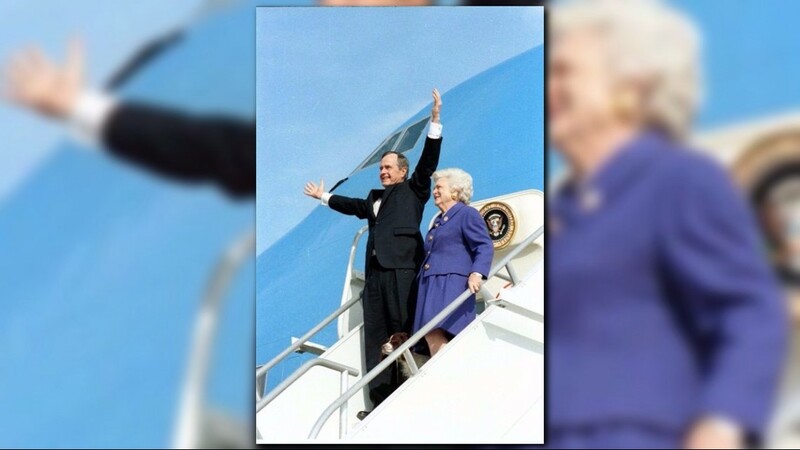 President and Mrs. Bush leave for Camp David, October 25, 1991. 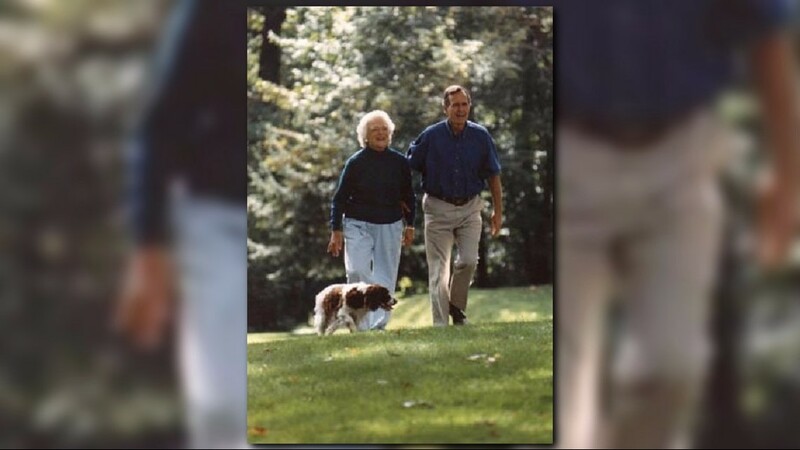 President and Mrs Bush walk with Millie at Camp David, September 19, 1992. 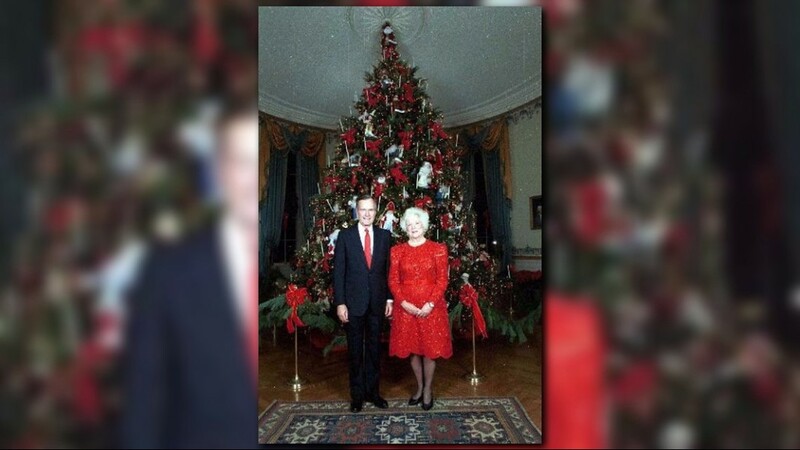 President and Mrs. Bush in front of the 1991 White House Christmas Tree, December 11, 1991. 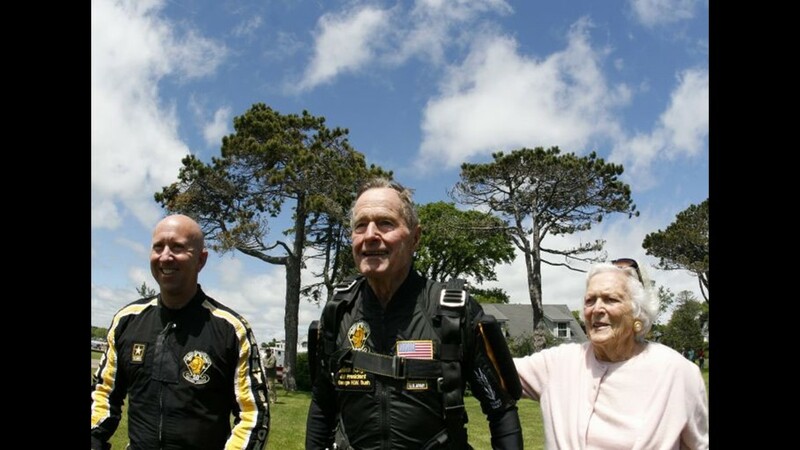 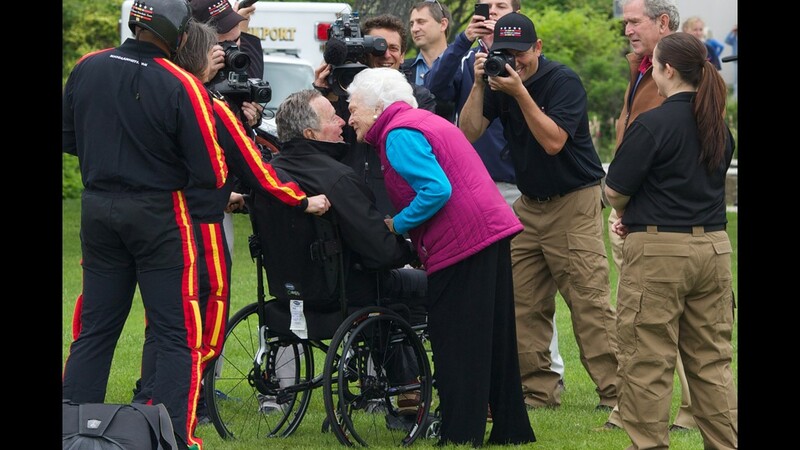 President and Mrs. Bush walk with a member of the Golden Knights following his tandem jump above Walker's Point, Kennebunkport, Maine, June 12, 2009. 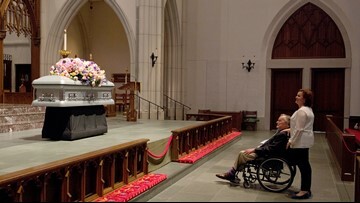 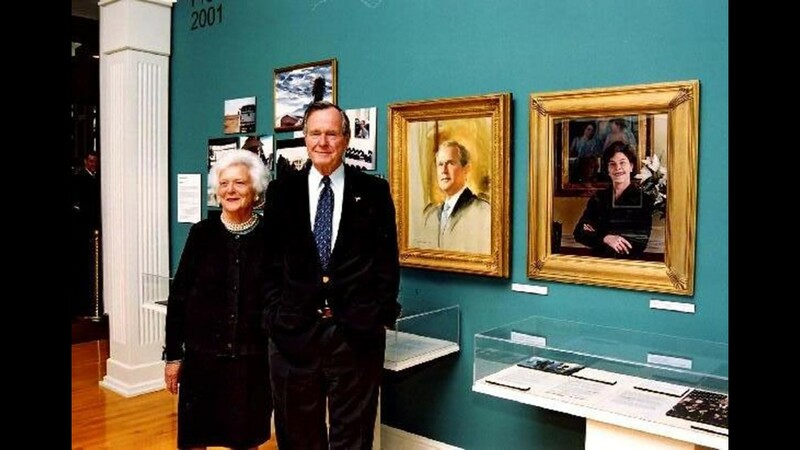 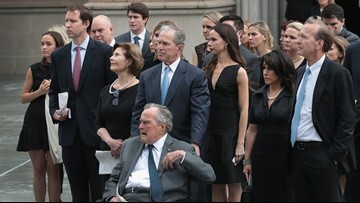 Former President and Mrs. Bush at the opening of the "Fathers and Sons" exhibit, March 11, 2002. 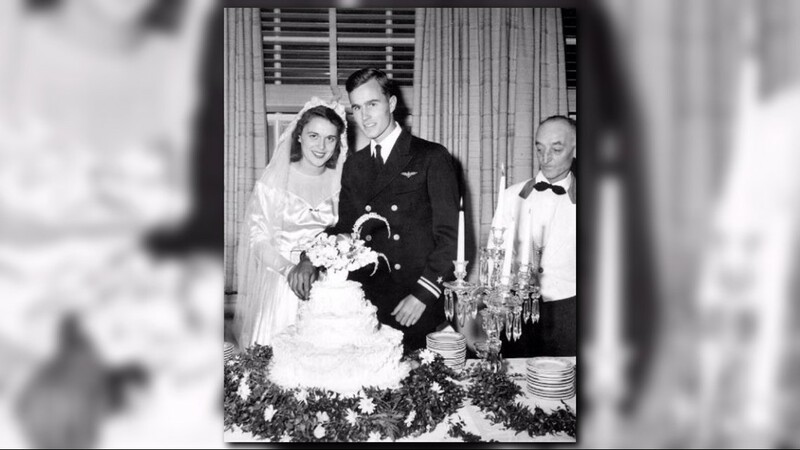 George and Barbara Bush cut their wedding cake, Rye, New York. 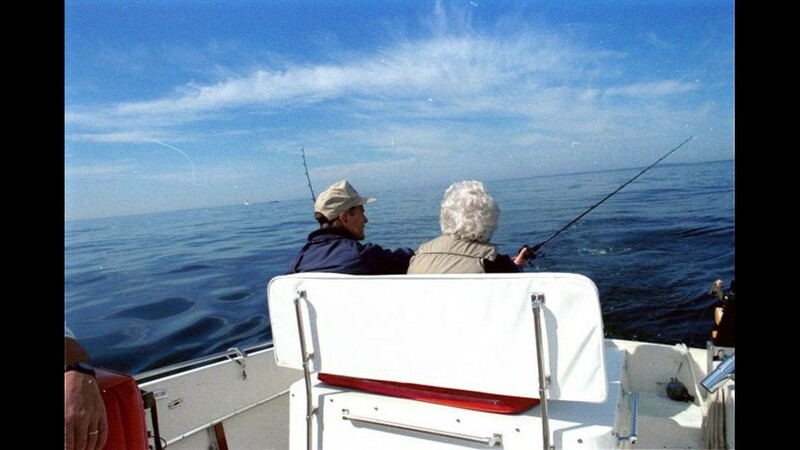 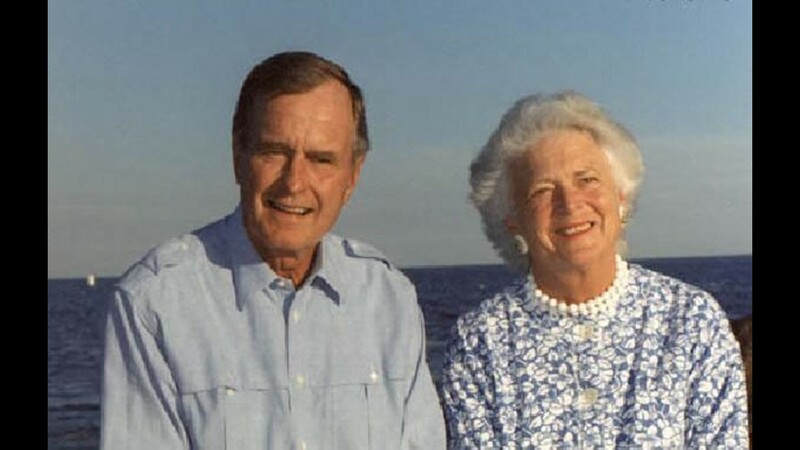 President and Mrs. Bush fish off the coast of Walker's Point, Kennebunkport, Maine, August 7, 1991.